Note of September 14, 2015: In response to information supplied by a reader on Martha Ellen's schoolmate Edward Whittier Cross of Methuen, Massachusetts, I've added an image of the page Edward shared with Eliza Philbrick of Seabrook, New Hampshire. See the image and information farther below. 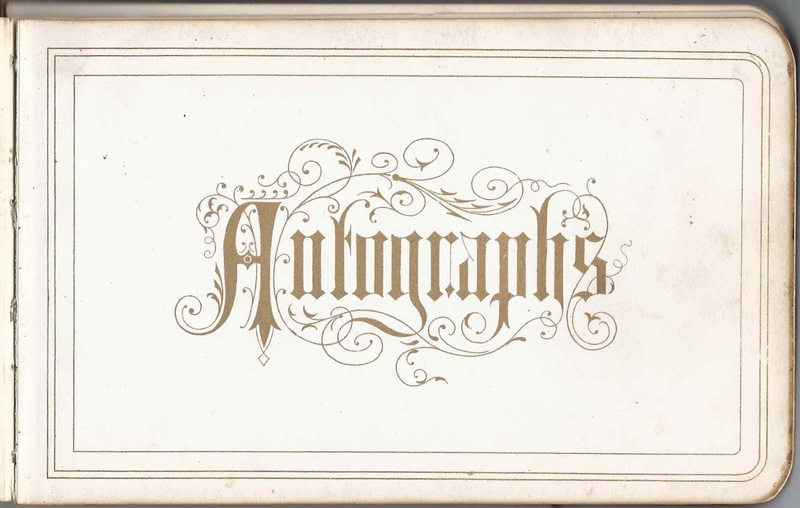 1857-1872 autograph album that belonged to Martha Ellen Jackman of Newburyport, Massachusetts, with some sentiments collected from faculty and students while she attended Putnam Free School at Newburyport. 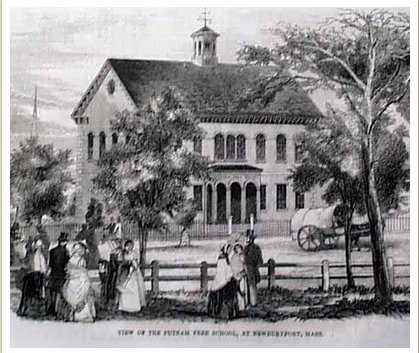 Below, the Putnam Free School as shown in an engraving in a Gleason's Pictorial, published at Boston, Massachusetts, on November 13, 1852. 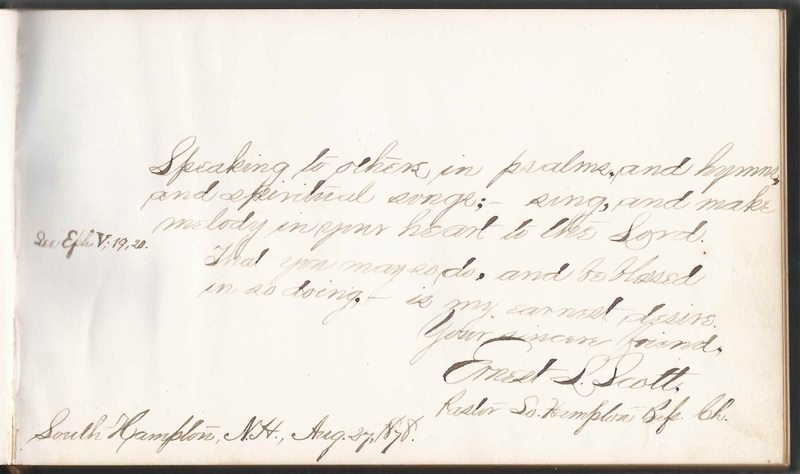 Note: Another post features the 1850s autograph album of Putnam Free School student, Sarah E. Hanson Corliss of Salisbury, Massachusetts. 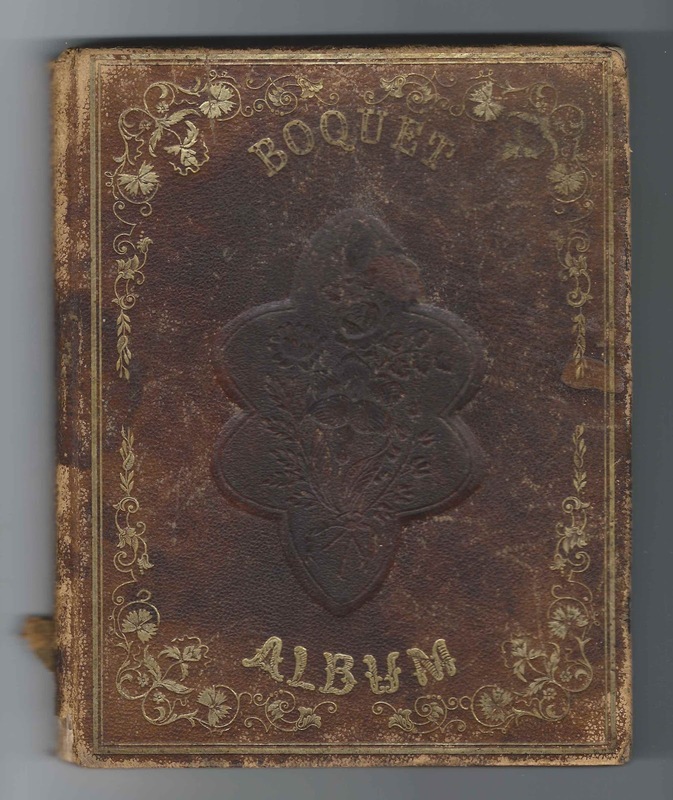 The album was given to Martha Ellen Jackman by her brother. 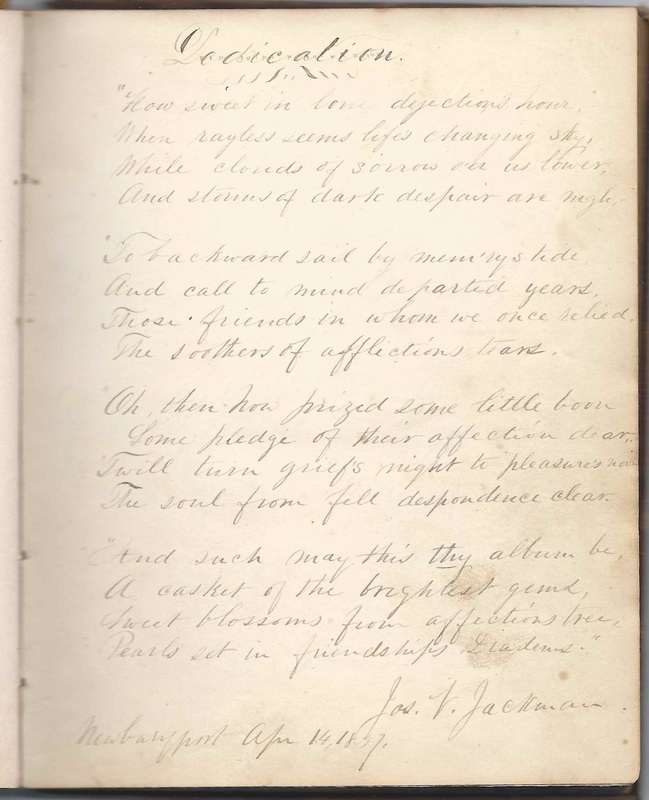 Since Joseph Varnum Jackman wrote a dedication page at Newburyport, Massachusetts, on April 14, 1857, it's likely that he was the brother who gifted the album. 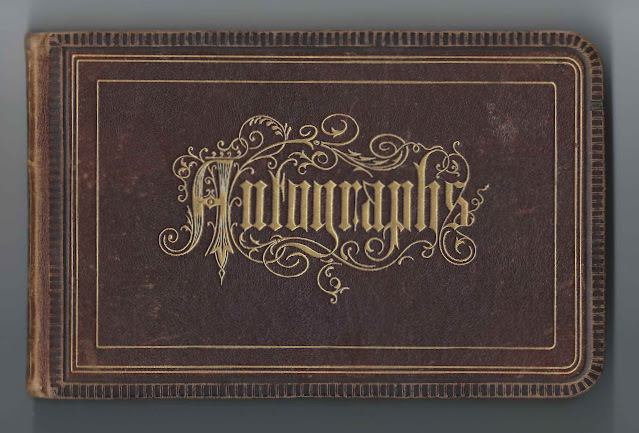 Martha Ellen's other brothers, William Henry Jackman and Winfield Scott Jackman, did not inscribe pages in her album. 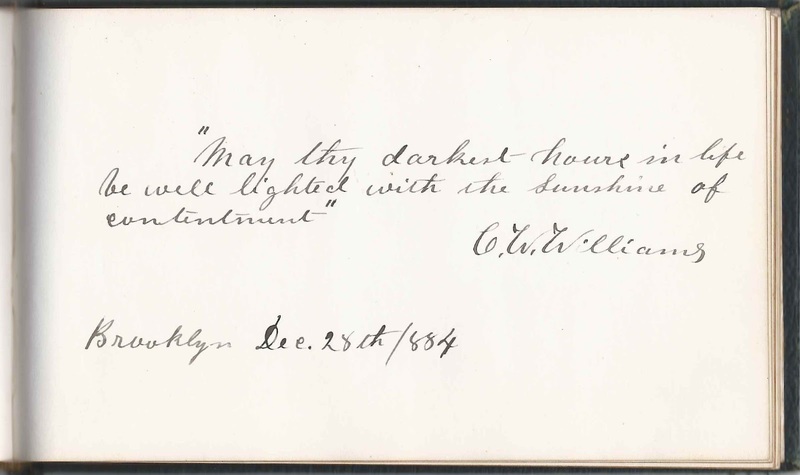 The album, published by J. C. Riker of New York, is approximately 7-3/4" x 6-1/4" and contains the sentiments of 99 of Martha Ellen's relatives, instructors, classmates and friends. An alphabetical list of the signers, complete with any residence, school or family relationship information, appears at the end of this post. Martha Ellen Jackman was born 15 August 1841 at Newburyport, Massachusetts, the daughter of William Thomas Jackman and Sarah Mary Coburn (Varnum) Jackman, Newbury, Massachusetts, natives. There's no occupation listed for Martha Ellen Jackman in the 1870 Census of Newburyport, where she was living with her parents. However, her father was listed as a farmer, so it's likely Martha was busy on the farm. By 1880 Martha was still in the household but her father had died. Martha was working in a shoe factory, and her brother and uncle David Jackman were keeping the farm going, it seems. By 1900, her mother had passed away. Martha was still living on the farm, it appears, now apparently run by her brother Joseph Varnum Jackman. I don't believe Martha Ellen Jackman ever married. She died 13 February 1908 at Newburyport, Massachusetts. If you have corrections and/or additions to the information above, or information on any of the signers listed below, please leave a comment or contact me directly. 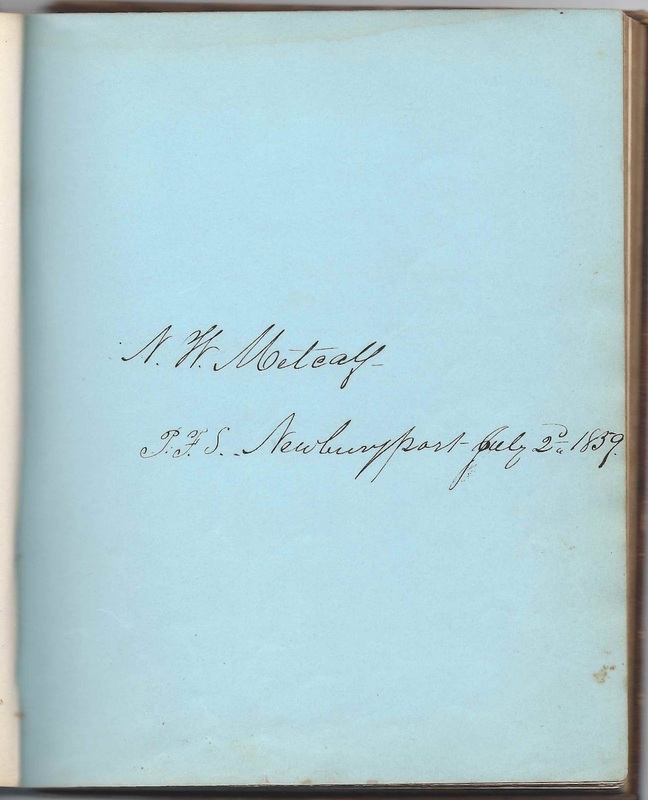 The N. W. Metcalf who signed a page at Putnam Free School on July 2, 1859, was presumably Nathaniel Whiting Metcalf, who taught at Putnam Free School from August 1857 to August 1859. One page contained the sentiments of two of Martha Ellen's instructors. 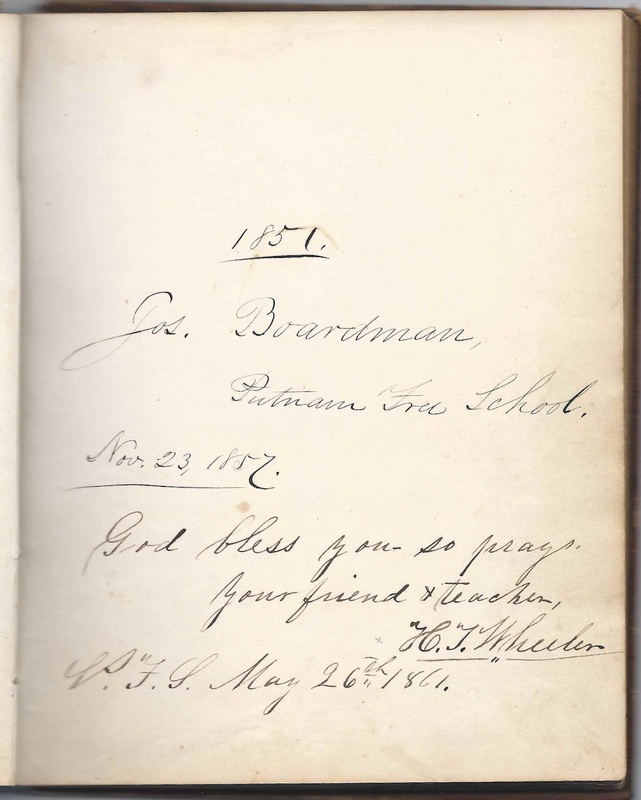 Joseph Boardman inscribed the page on November 23, 1857. Teacher H. T. Wheeler, presumably Hylas T. Wheeler, added his sentiment on May 26, 1861. I'd like readers' opinions on the name of the signer below, who signed at Newburyport, Massachusetts, on August 18, 1861. The surname is Badger, and the first initial appears to be a C, but the the jury is out on the middle initial. Although it doesn't like much like an F, there was a Charles F. Badger at Newburyport, a stationer and bookseller. 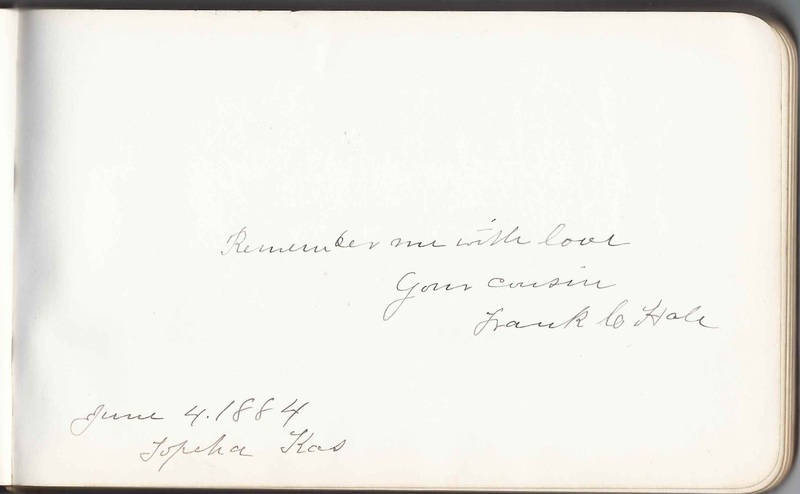 Annie, signed on April 6, 1859; shared the page with Carrie W.
C. ? Badger, signed at Newburyport, Massachusetts, on August 18, 1861; middle initial might be I or L or S or F or ? Annie E. Blake, signed at Newburyport, Massachusetts; "Putnam from 75-61"
Margaret Clarkson, signed at Newburyport, Massachusetts, on July 11, 1861; shared the page with E. J. C.
E. E. Deane of Waynesville, Georgia, signed at Putnam Free School on November 20, 1858; "A Southern Friend"
Almira A. Elliott of Amesbury, Massachusetts, signed at Putnam Free School on August 22, 1860; shared the page with S. M. B.
R. C. Gerrish of East Salisbury, Massachusetts, signed at Putnam Free School on May 15, 1861; shared the page with Ellen E. C.
Ann Harris, signed in November 1857; "Age 97". She was Anna (Toppan/Tappan) Harris, daughter of Edward and Sarah (Bayley) Toppan/Tappan and widow of Jonathan Harris (1757-1822). Anna would die on December 22, 1860. 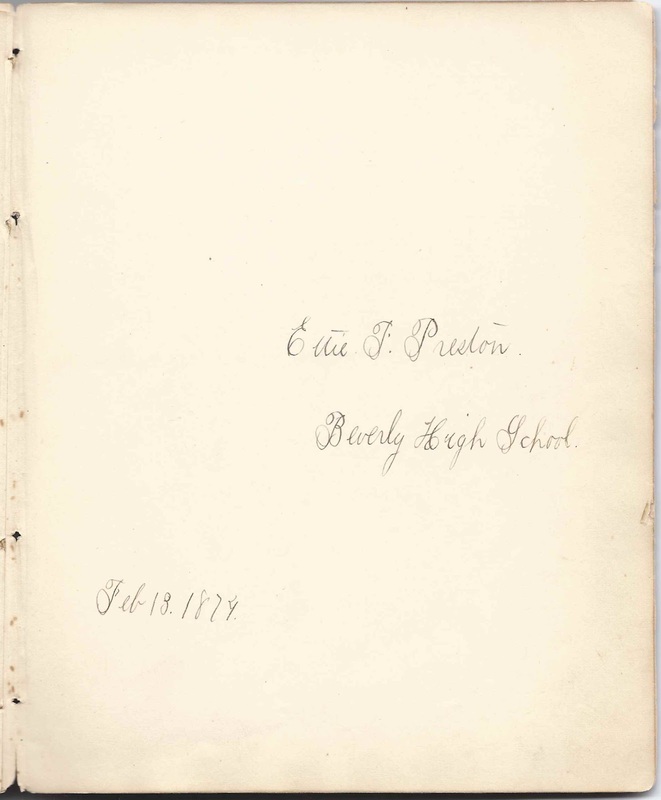 E. M. Ilsley, signed at Putnam Free School on March 9, 1859; shared the page with Hannah J.
Joseph V. Jackman, signed at Newburyport, Massachusetts, on April 14, 1857. 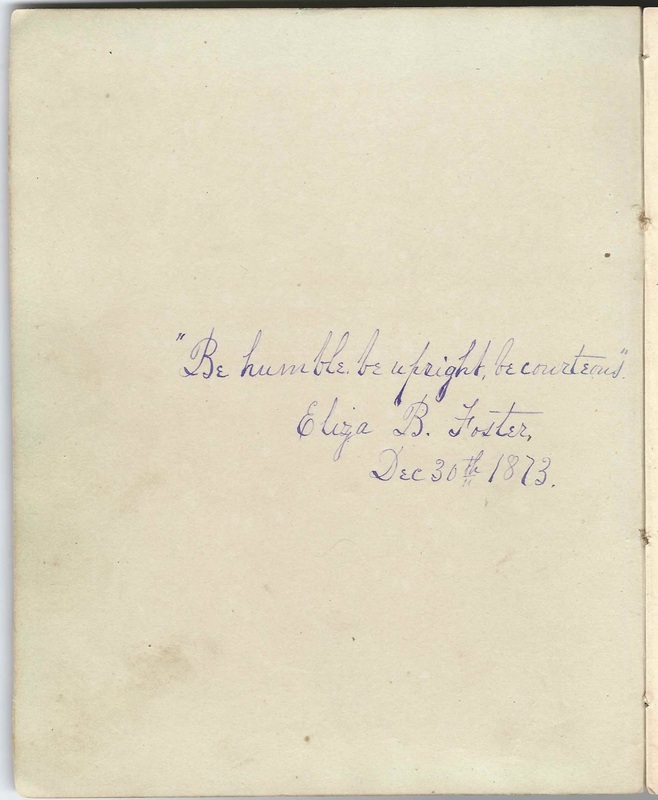 A dedication - it was presumably Joseph Varnum Jackman who gave the album to his sister Martha Ellen Jackman. Eben Little, Jr. of Newbury, Massachusetts, signed on June 3, 1861. N. W. Metcalf, signed at Putnam Free School, Newburyport, Massachusetts, on July 2, 1859. Presumably Nathaniel Whiting Metcalf, who taught at Putnam Free School from August 1857 to August 1859. 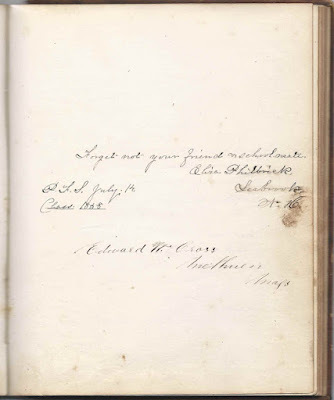 Elbridge B. Moody of East Salisbury, Massachusetts, signed on May 31, 1861; "Class "61""; shared the page with James H. Townsend; Alfred L. Sargent; and Henry Martyn Cross, M.D. 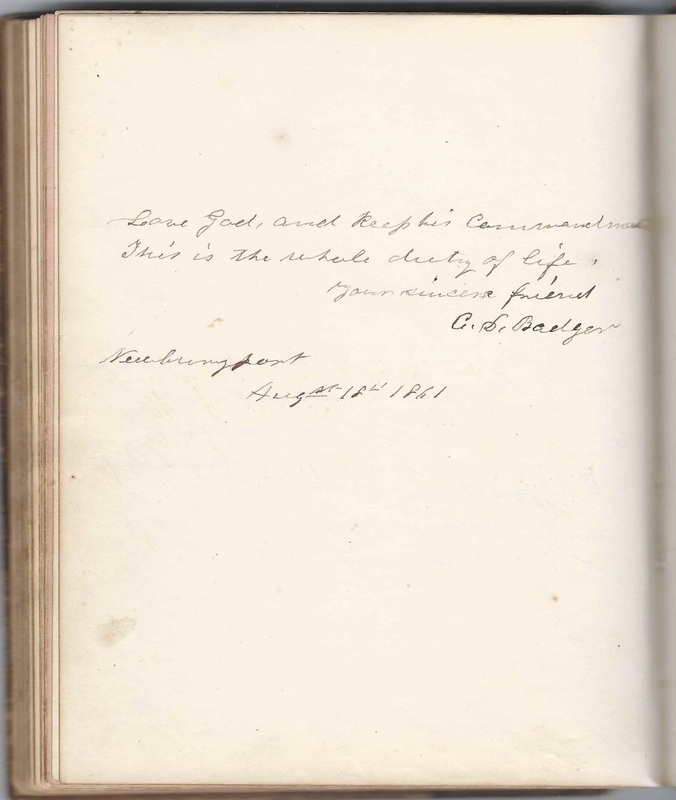 Alfred L. Sargent, signed on May 31, 1861 at Putnam Free School; shared the page with Elbridge B. Moody; James H. Townsend; and Henry Martyn Cross, M.D. 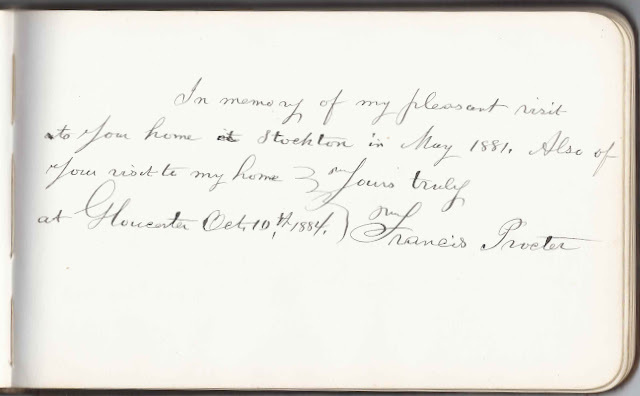 Margaret M. Stone, signed on November 28, 1860; shared the page with S. May S.
James H. Townsend, signed on May 31, 1861; shared the page with Elbridge B. Moody; Alfred L. Sargent; and Henry Martyn Cross, M.D. S. M. Winkley, signed at Putnam Free School on March 16, 1868. Perhaps Susan Maria Winkley, who would marry Rev. Henry Webster Parker in 1876. 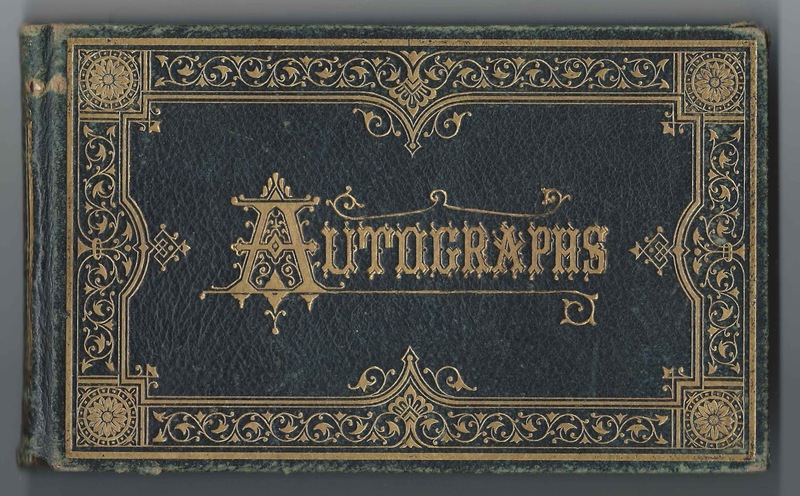 1873-1881 autograph album that belonged to Nellie Quarles Choate, while she was at Beverly High School, Beverly, Massachusetts, and at the University of Minnesota. 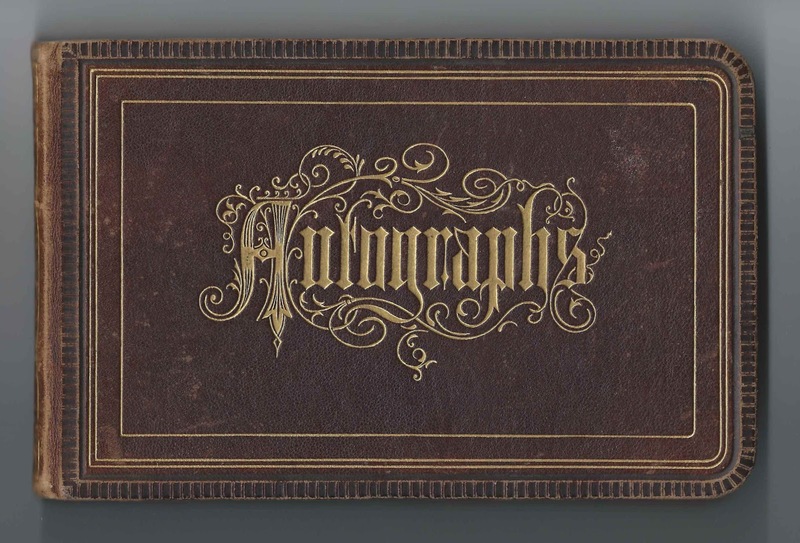 The album is approximately 7-3/4" x 6" and contains the sentiments of 80 of Nellie's relatives, friends and schoolmates. A surname list and an alphabetical list of the signers, with any accompanying residence, school or family relationship information, appear at the end of this post. 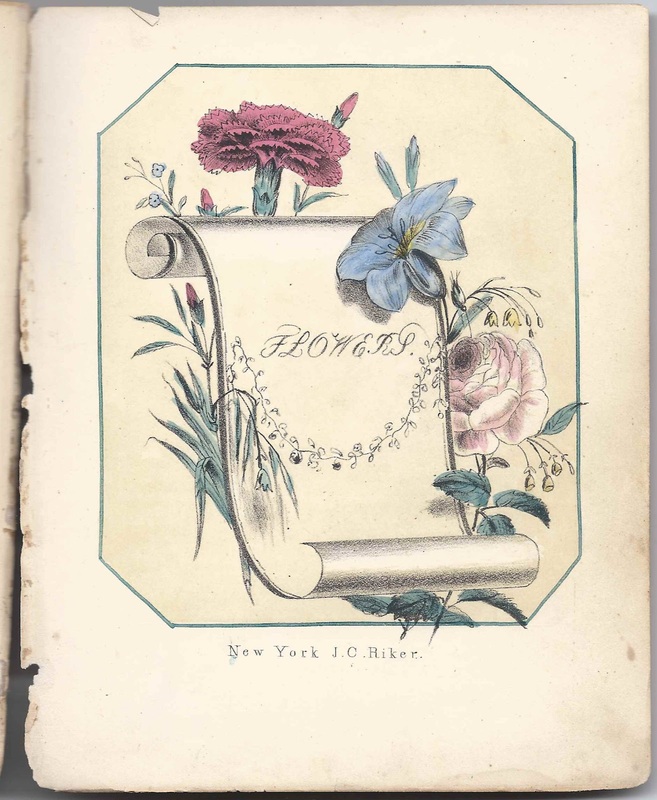 The album was printed by the J. C. Riker Company of New York and contains several illustrated pages throughout. The illustrations are framed in boxes that are not centered on the page, apparently by design, such as on the page below. Nellie Quarles Choate was born 22 July 1859 at Beverly, Massachusetts, the daughter of Frederick William Choate, a lawyer, probate judge and state senator, and his second wife Olive Eleanor (Johnson) Choate. The F. W. Choate who signed a page in the album was presumably Nellie's father Frederick William Choate. Frederick William Choate was first married to Eliza M. Breck, with whom he had three daughters and a son; Eliza died in 1853. 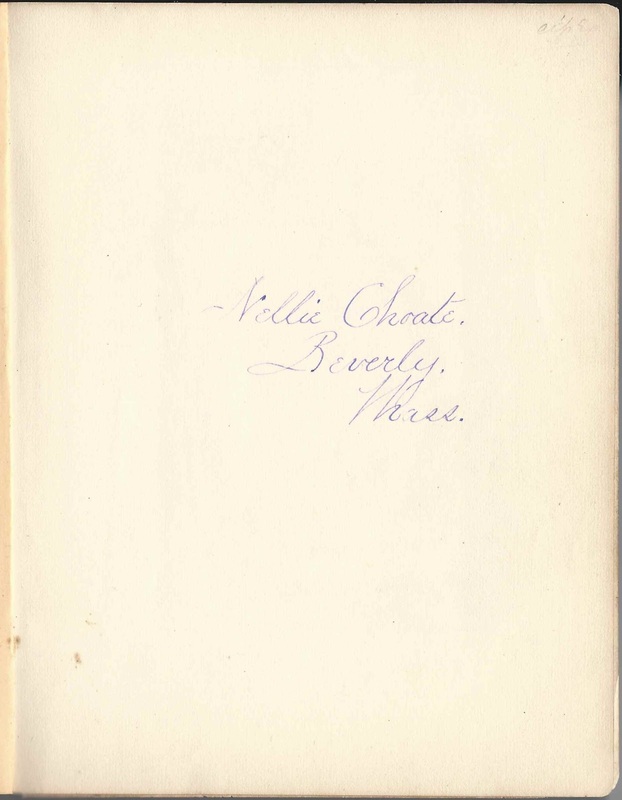 The son, Theodore Breck Choate, died at the age of two, but the daughters survived to adulthood and signed pages in Nellie's album. The Eliza B. Foster who signed a page on December 30, 1873 was presumably Eliza Breck (Choate) Foster, wife of Captain Samuel Jeremiah Foster, and daughter of Frederick William Choate and Eliza (Breck) Choate. 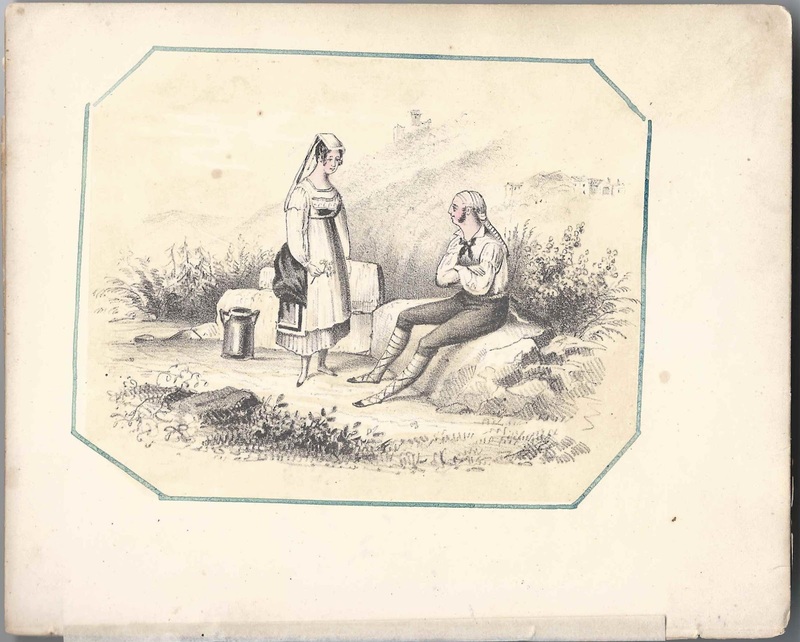 See sample pages and extensive descriptions of Eliza's 1874 and 1875 diaries here. 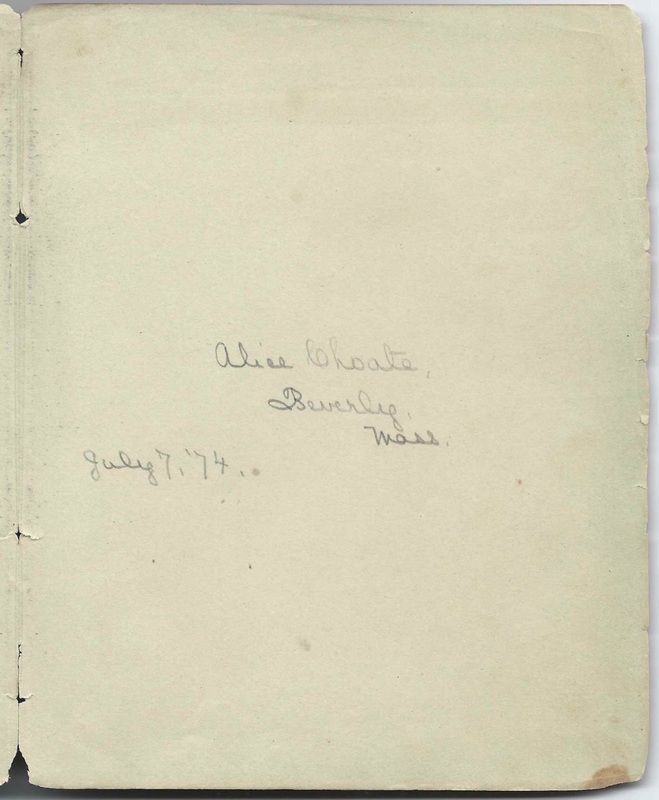 The Alice Choate of Beverly, Massachusetts, who signed a page on July 7, 1874, was presumably Alice Dunlap Choate, daughter of Frederick William Choate and Eliza (Breck) Choate. The Grace Choate of Beverly, Massachusetts, who shared a page with Sara Pierrepont McNair, was presumably Nellie's half-sister Grace Choate, daughtert of Frederick William Choate and Eliza (Breck) Choate. 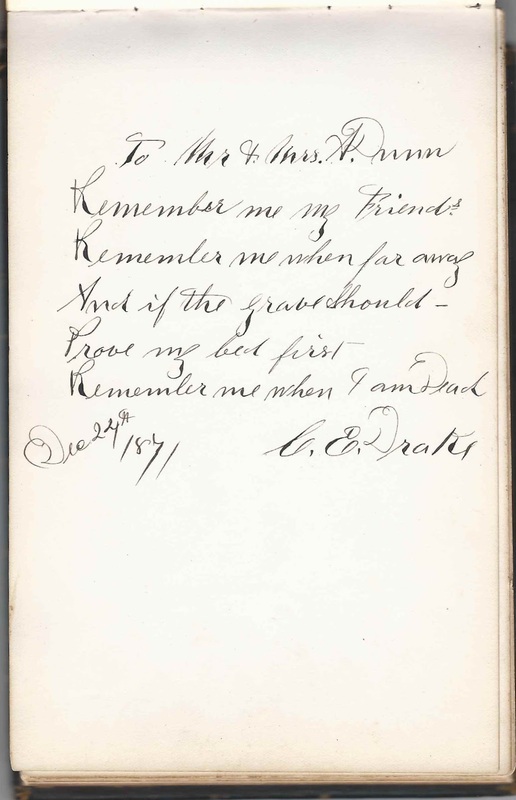 Grace's future husband, Charles L. Eaton signed two pages in Nellie's album. Sara Pierrepont McNair, who shared the page above and inscribed her name on January 2, 1879, is shown in most records as Sarah Pierrepont McNair. She was Nellie's fellow student at the University of Minnesota. Frederick William Choate had five children with second wife Olive Eleanor (Johnson) Choate, but two died in childhood and another, William Choate, at the age of about 30, not long after the death of his parents. Surviving were Emma Choate, who moved to Sharon, Massachusetts, birthplace of her mother, and album owner Nellie Quarles Choate. Emma didn't sign a page in the album, but several signers noted that they were at Sharon, Massachusetts, at the time of signing, and were perhaps relatives of Nellie's mother Olive Eleanor (Johnson) Choate, who was born there. A few of the signers indicated that they were Nellie's classmates at Beverly High School at Beverly, Massachusetts. One of these was Ettie F. Preston, presumably Esther F. Preston, who signed her page on February 13, 1874. After high school, it appears that Nellie Quarles Choate attended the University of Minnesota. She's shown in a University of Minnesota catalog that lists the attendees for the year 1878-1879. 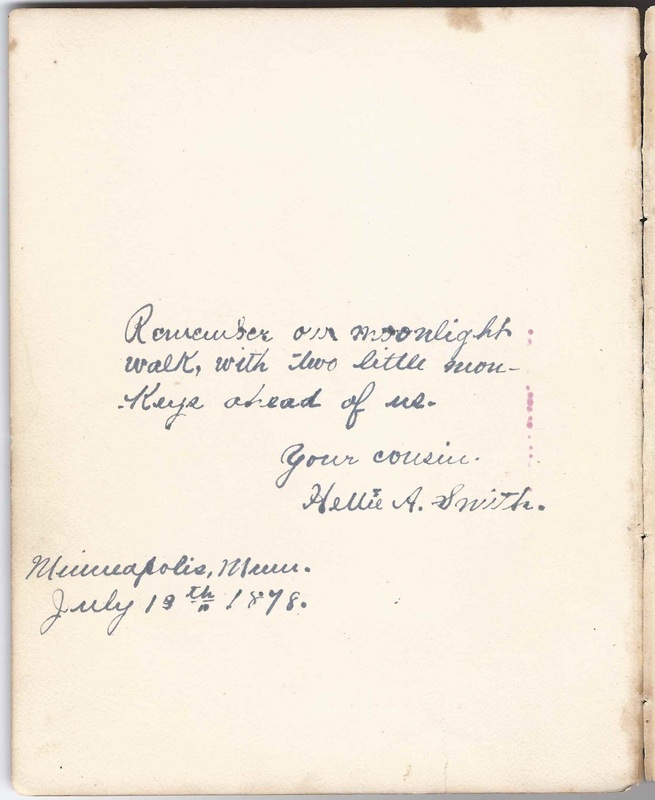 Nellie's cousin, once removed, Hettie Augusta Smith, daughter of Massachusetts natives William Judson Smith and Augusta (Norwood) Smith, signed a page in Nellie's album at Minneapolis, Minnesota, on July 13, 1878. Hettie was also a student at the University of Minnesota, where her mother Augusta (Norwood) Smith was an English instructor - it was she who decided on the school colors of maroon and gold, which are still in use today. Perhaps William and Augusta invited Nellie to visit and to attend the University of Minnesota. Augusta (Norwood) Smith was the daughter of Adaline Augusta (Choate) Norwood, a sister to Nellie's father Frederick William Choate. 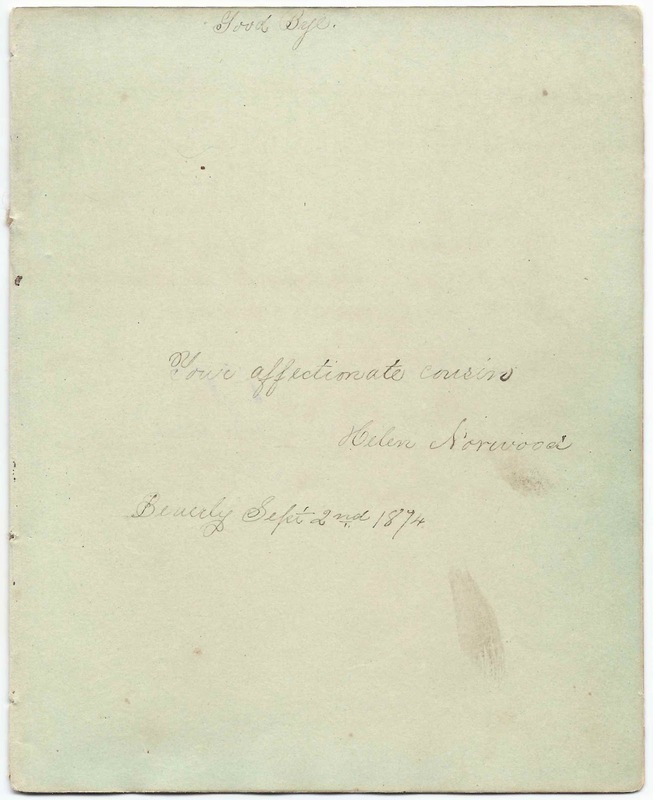 Nellie's cousin Helen Norwood, Augusta (Norwood) Smith's sister, signed a page at Beverly, Massachusetts, on September 2, 1874. She would marry George Morris Bard on 16 June 1881 at Beverly, Massachusetts, and they would move to the Midwest. If you have corrections and/or additions to any of the information above, or information on any of the signers listed below, please leave a comment or contact me directly. Thanks! Rev. 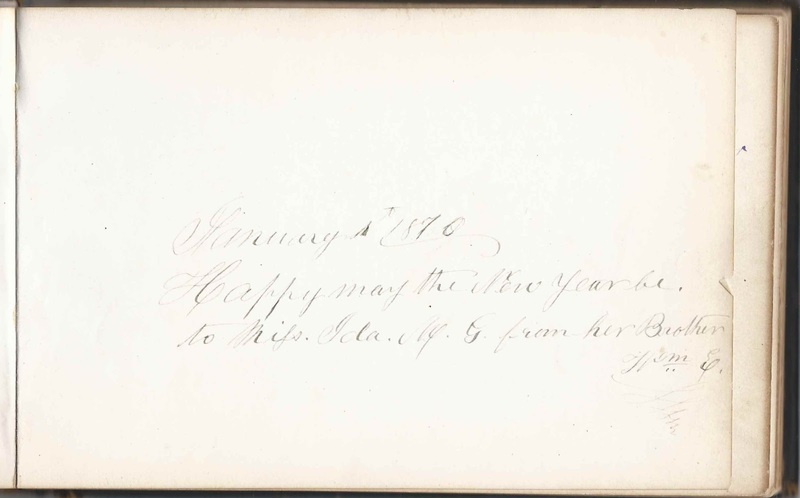 James A. McGowan of Shakopee, Minnesota, inscribed a page on April 16, 1879. He was James Alexander McGowan, born at Philadelphia, Pennsylvania, on August 5, 1843. 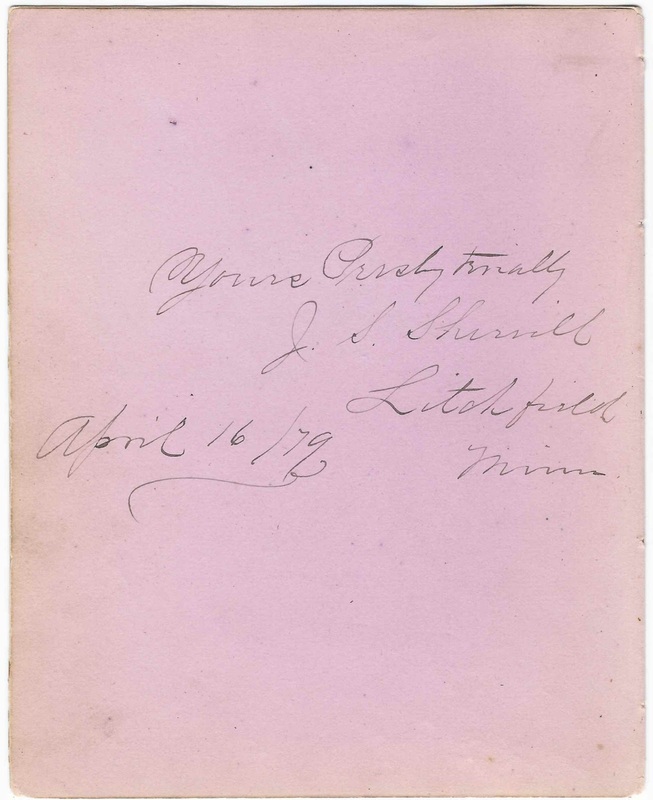 J. S. Sherrill of Litchfield, Minnesota, signed a page, also on April 16, 1879. He was Presbyterian Rev. John Saxton Sherrill, born at Pike, New York, on 18 February 1844. 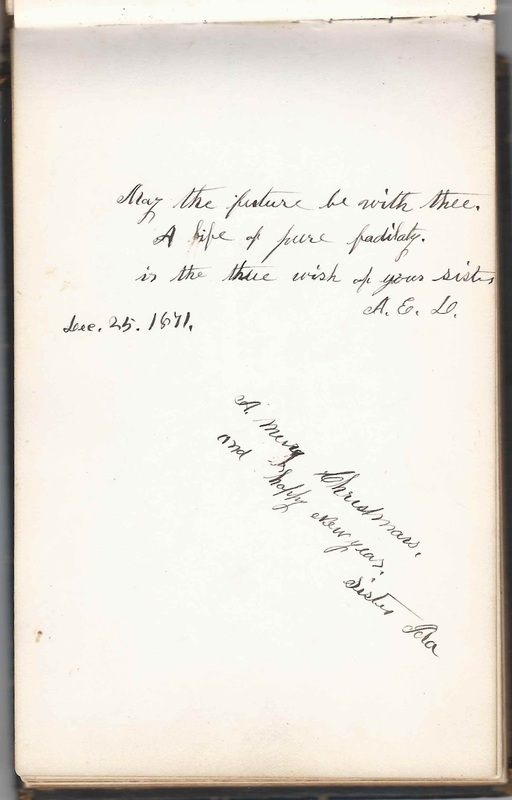 Gussie E. Kiefer of Saint Paul, Minnesota, signed a page at the University of Minnesota, on October 28, 1878. She was Augusta Elizabeth Kiefer. 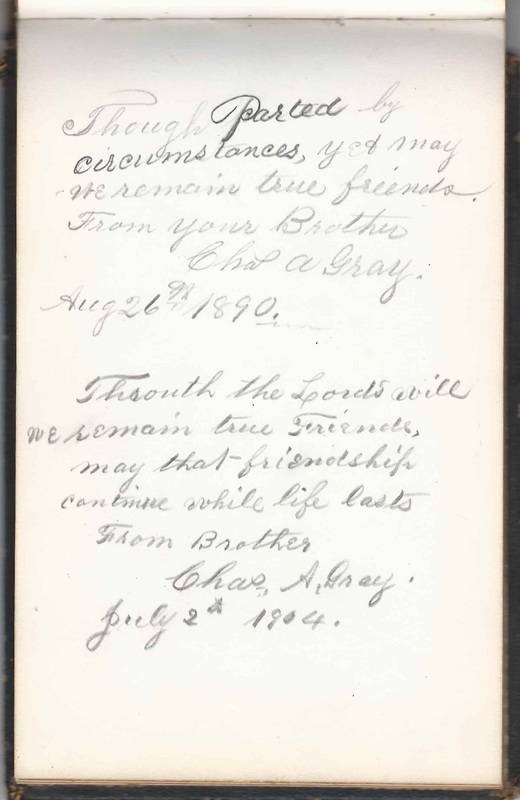 A. S. S., signed on February 16, 1874; page shared with M. E. W.
M. E. W., signed on February 16, 1874; shared the page with A. S. S.
F. W. Choate, signed at Beverly, Massachusetts, on December 30, 1873. Presumably Nellie's father Frederick William Choate or his son. Alice Choate of Beverly, Massachusetts, signed on July 7, 1874. She may have been Alice Dunlap Choate, Nellie's older half sister. C. L. Eaton, signed on January 16, 1874. Presumably Charles L. Eaton, husband of Nellie's older half sister, signer Grace (Choate) Eaton. He may have been the C. LO. Eaton who signed another page. Eliza B. Foster, signed on December 30, 1873; presumably Eliza Breck (Choate) Foster, wife of Samuel Jeremiah Foster, and half sister of album owner Nellie Quarles Choate. Wilhelmina Galloupe, signed November 27, 1874 at 255 Beacon Street [presumably the Beacon Street at Boston, Massachusetts]. She would marry Samuel J. Mixter in 1879. Lou E. Hollister of Janesville, Minnesota, signed on November 22, 1878; "814". She was Louise Elma Hollister of Marshfield, Minnesota. She shared the page with Cora Hathaway. 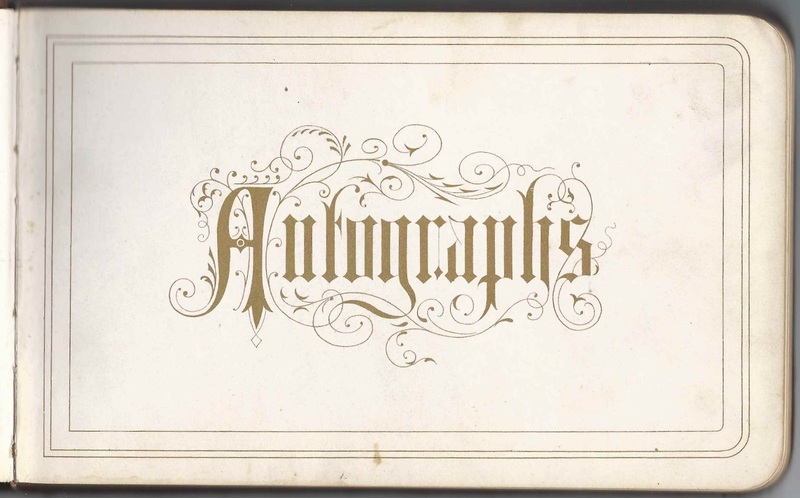 Lou B. Hopkins of Duluth, Minnesota, signed on March 31, 1879 [presumably at the University of Minnesota]. Lucy Bridges Hopkins. Gussie E. Kiefer of Saint Paul, Minnesota, signed at University [University of Minnesota], on October 28, 1878. She was Augusta Elizabeth Kiefer. Eleanor Kilham, signed on September 7, 1874. Though she didn't note a residence, she was from Beverly, Massachusetts. Presumably Eleanor Bridge Kilham, sister of Alfred Chadwick Kilham, who may have been the A. C. Kilham who signed a page. 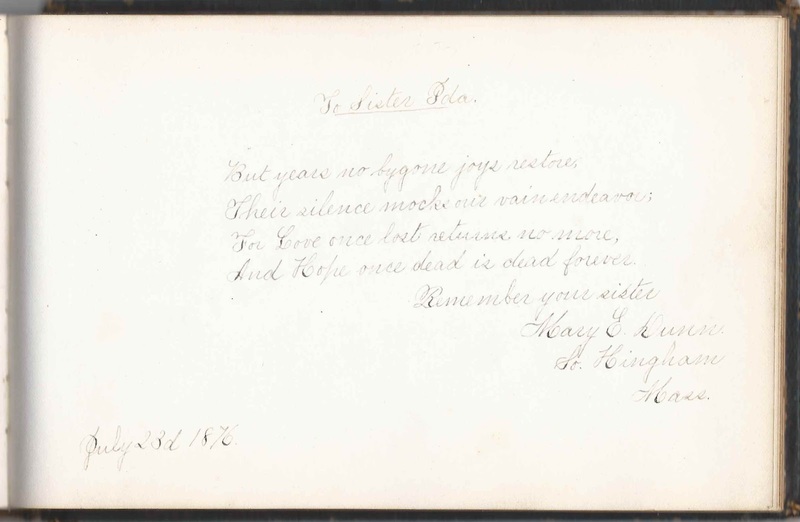 A. C. Kilham, signed at Beverly, Massachusetts, on August 29, 1877. Presumably Alfred Chadwick Kilham, brother of signer Eleanor Kilham. Bessie L. Kilham of Beverly, Massachusetts, signed in March 1876. Perhaps sister of signer L. H. Kilham, who might have been Lizzie H. Kilham. L. H. Kilham, signed on March 18, 1874. Perhaps Lizzie H. Kilham, sister of signer Bessie Kilham. Laura A. Kreis of Monticello, Minnesota, signed at the University of Minnesota, on November 22, 1878. Laura Augusta Kreis. M. Lizzie Lanphear, signed at Beverly, Massachusetts, on April 13, 1874. Presumably Mary Lizzie Lanphear who would marry Hezekiah Ober Woodbury that same year. Nellie F. McNear of Wiscasset, Maine, signed at the University of Minnesota on March 5, 1879. Nellie Frances McNear was the daughter of Captain Wilson McNear and Mary Elizabeth (Kennedy) McNear. Sadly, Nellie died in 1881. 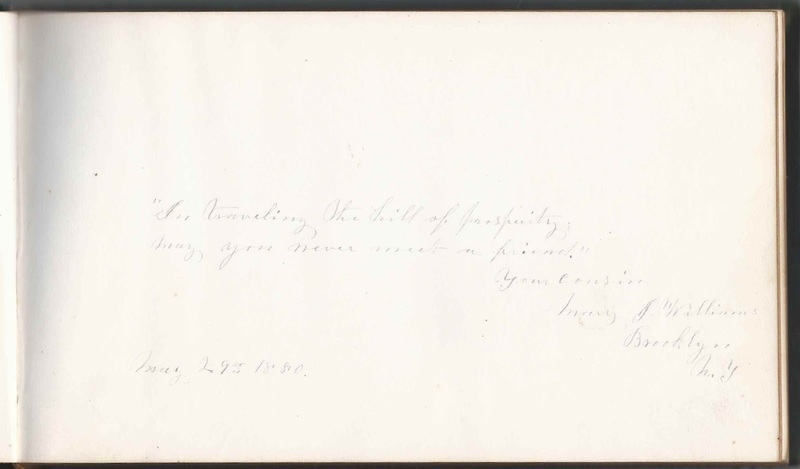 Helen Norwood, signed at Beverly, Massachusetts, on September 2, 1874; "Your affectionate cousin". Album owner Nellie Choate's father, Frederick William Choate, and Helen Norwood's mother, Adaline Augusta (Choate) Norwood, were brother and sister. Vina B. Norwood of Hyde Park, Illinois. She would marry J. Blackburn Jones at Hyde Park, Illinois, on 30 August 1877. Mrs. Plantagenet Potts. "Nellie - Adieu", perhaps reflecting that Nellie would be leaving Beverly, Massachusetts, for Minnesota, or vice versa. Or the name was a joking reference to the Plantagenet Potts of literature. Hettie A. Smith, signed at Minneapolis, Minnesota, on July 13, 1878; Nellie's cousin, once removed. Hettie's parents were William Judson Smith and Augusta (Norwood) Smith. Augusta's (Norwood) Smith's mother was Adaline Augusta (Choate) Norwood, a sister to Nellie's father Frederick William Choate. Hettie's family may have been the reason that Nellie went to Minnesota. W. G. Sperry, signed at Beverly, Massachusetts, on March 2, 1874; possibly Willard G. Sperry, but I'm not sure of his middle initial. Maggie Whitney, signed on February 6, 1874; shared the page with James Rogers. 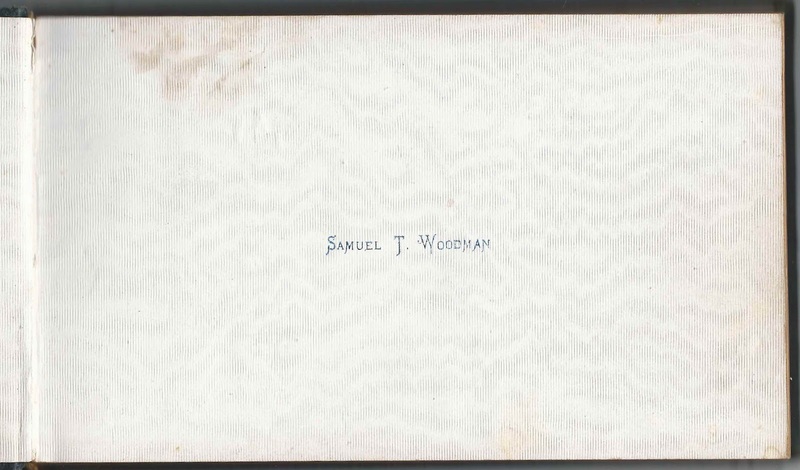 1878-1895 autograph album of Samuel Thomas Woodman of South Hampton, New Hampshire. He stamped his name on the first and last end papers. 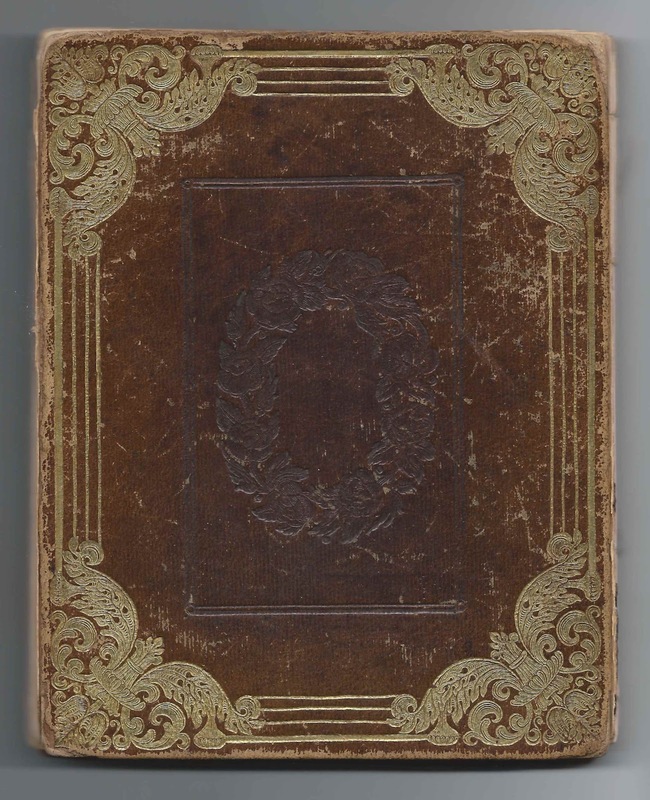 The album is approximately 8" x 4-3/4" and contains the sentiments of 22 of Samuel's friends, including his pastor. An alphabetical list of the signers appears at the end of this post. Samuel Thomas Woodman was born 23 September 1837 at Salisbury, Massachusetts, the son of John Collins Woodman and Judith S. (Lang) Woodman, who were born at South Hampton, New Hampshire, and Amesbury, Massachusetts, respectively. In the 1880 Census of South Hampton, New Hampshire, Samuel Thomas Woodman was shown as living with his parents and working as an organ tuner. I don't believe he ever married. A 19 October 1892 issue of "The Lebanon Daily News" refers to him as "the well known South Hampton agriculturist". Sadly, Samuel Thomas Woodman died before his time on 5 December 1896 at South Hampton, Massachusetts. His death record indicates that he died of complications of a fractured skull but doesn't mention how Samuel's skull happened to be fractured. Samuel's cousin, Mary J. (Woodman) Williams and her husband Charles W. Williams of Brooklyn, New York, signed pages in 1884. Mary's father was James Merrill Woodman, a brother to John Collins Woodman, Samuel's father. 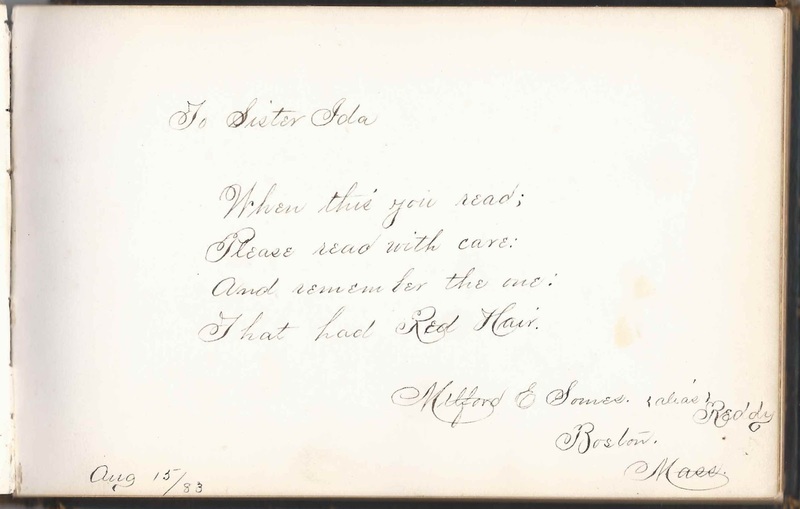 Samuel's pastor, Ernest L. Scott, pastor of the South Hampton Baptist Church, inscribed a page at South Hampton, New Hampshire, on August 27, 1878. 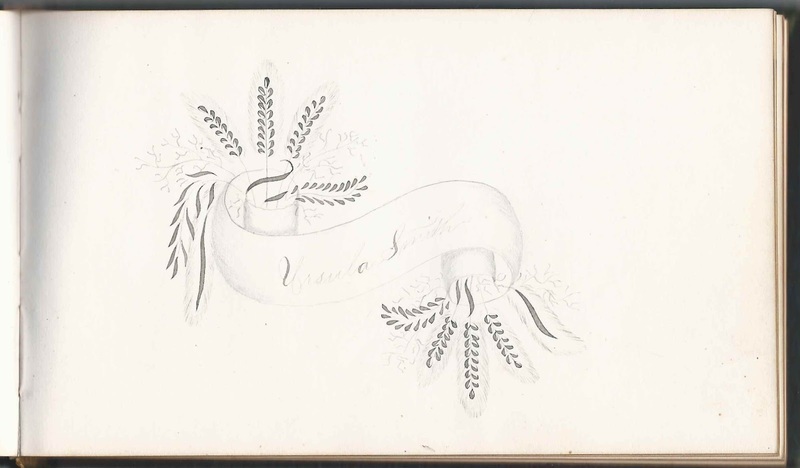 Ursula Smith sketched an intricate scroll design. 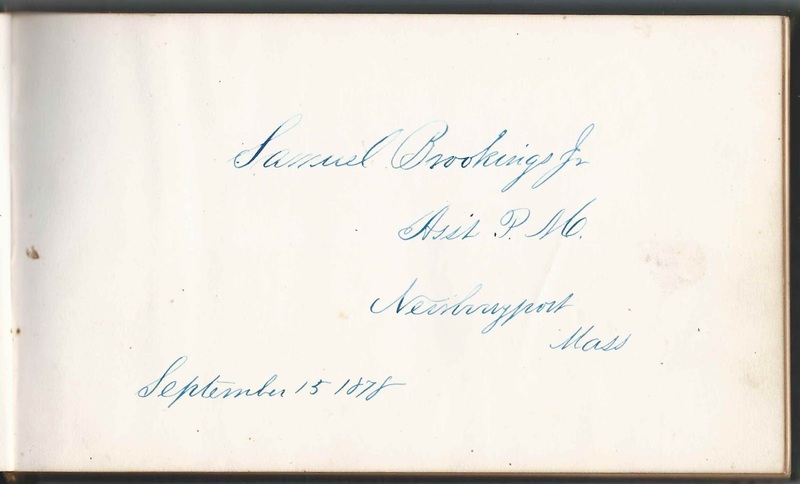 Samuel Brookings, Jr., who gave his job title as Assistant P.M. [presumably postmaster], signed a page at Newburyport, Massachusetts, on September 15, 1878. 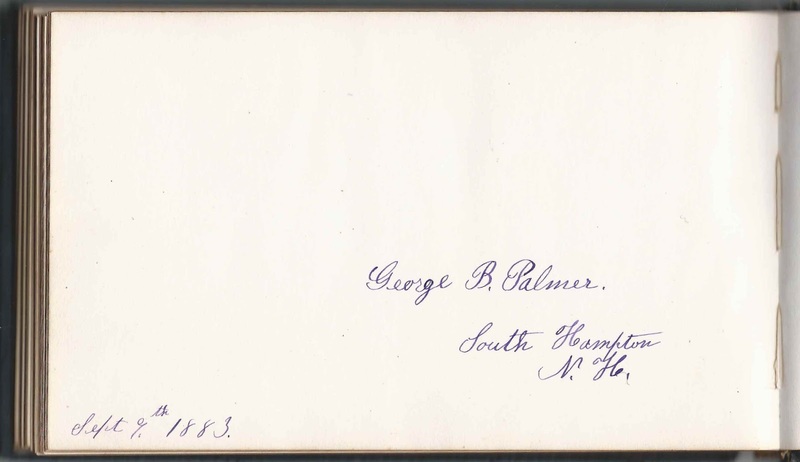 George B. Palmer and Mae Palmer of South Hampton, New Hampshire, signed facing pages on September 9, 1883 and May 23, 1883, respectively. I believe they were George Bailey Palmer and wife Mary Olivia (Purinton) Palmer. George B. Palmer of South Hampton, New Hampshire, signed on September 9, 1883. 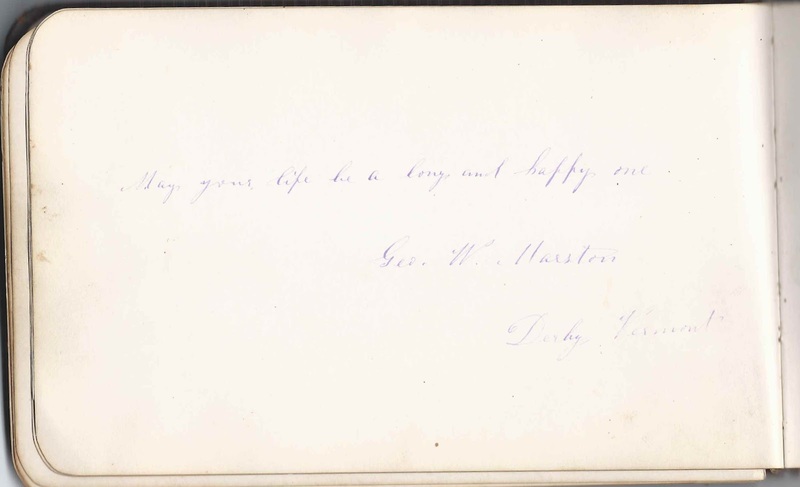 He was George Bailey Palmer, whose wife Mary Olivia (Purinton) Palmer, "Mae", signed the right facing page. Mae Palmer of South Hampton, New Hampshire, signed on May 23, 1883. She was Mary Olivia (Purinton) Palmer, "Mae", whose husband George Bailey Palmer signed the left facing page. Ursula Smith; she sketched an intricate scroll design. 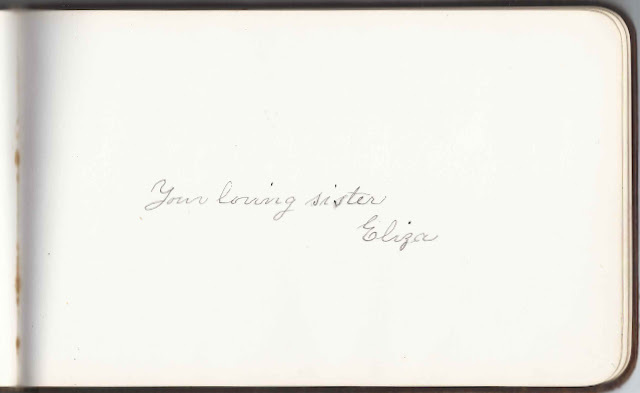 From a few clues found in this album, I believe it belonged to Elizabeth Dennison (Poole) Hale, "Lizzie", of Gloucester, Massachusetts, and Stockton, California. She was the wife of Joseph Poole, a Rockport, Massachusetts, native who had moved to California in 1850. 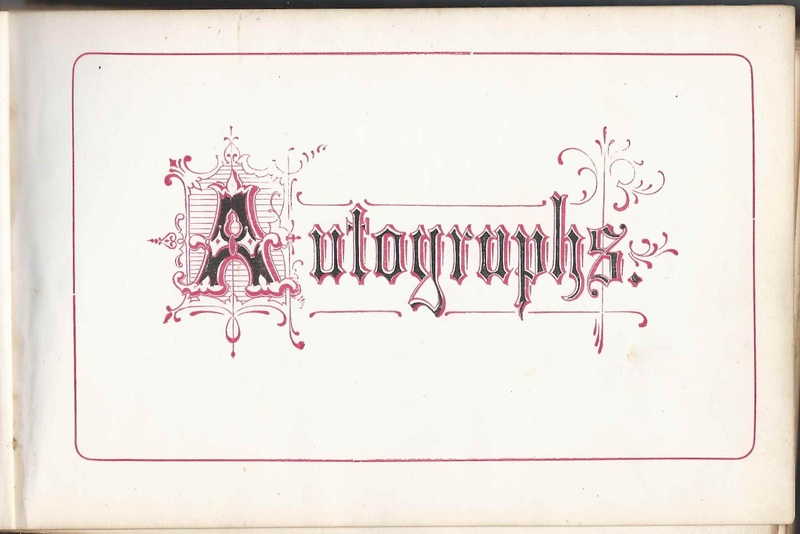 Most of the autographs were collected in 1884 when it appears that Lizzie traveled coast to coast to visit her Massachusetts family, judging from the page inscribed by Francis Proctor, who signed a page at Gloucester, Massachusetts, on October 10, 1884. Francis had gone to visit Lizzie in California in 1881. The many iconic Gloucester and Rockport surnames are listed alphabetically farther below. Hopefully a reader who has studied these families or the history of the area can provide relationships between Lizzie and many of the signers and the reasons for their dispersal to the Midwest and West. If I'm wrong about Lizzie's identity, I'd like to be corrected. Elizabeth Dennison Poole, "Lizzie", was born 20 March 1833 at Gloucester, Massachusetts, the daughter of Zebulon and Elizabeth Giddings (Woodbury) Poole. One signer in the album called herself Lizzie's sister. She was presumably Eliza Giddings Poole, born 13 March 1823 at Rockport, Massachusetts; she married Alfred B. Choate on 7 August 1844 at Gloucester, Massachusetts. It appears that Lizzie's family may have moved to or visited California, as on 29 May 1857 at San Francisco, California, Lizzie married merchant and farmer Joseph Hale, son of Stephen and Amelia (Wheeler) Hale. Joseph was born 8 March 1827 at Rockport, Massachusetts. According to the California Pioneer and Immigrant Files, 1790-1950, Joseph Hale arrived in California in May 1850 on the vessel Euphrasia, from Massachusetts around Cape Horn. He was the first to attempt swampland farming, on Grizzley Island in Suisun Bay. By 1860, the couple was enumerated at Stockton, California; they had a child Warden Eaton Hale, born about 1858, but, sadly, Warden died young in December 1860. Joseph Hale was listed as a farmer. Grace Farnsworth Hale, born 8 December 1867 at Stockton, California; married William Langdon Buckley, M.D. They may have had other children who did not survive to adulthood. Joseph Hale died on 3 April 1898 at Stockton, California. Elizabeth Dennison (Poole) Hale died at Linden, California, on 16 June 1910. Three people mentioned that they were Lizzie's cousin. 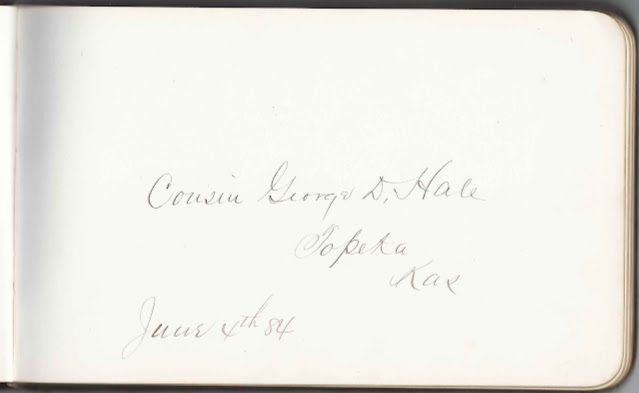 The Frank C. Hale of Topeka, Kansas, who called Lizzie a cousin, may have been Francis (Cook) Hale, wife of George Dennison Hale, who perhaps was the cousin of Lizzie's husband Joseph Hale, though he may have been related to Lizzie also, through the Dennison line. The other cousin was Martha L. Pickering of Rockport, Massachusetts, who signed her page on October 25, 1884. Though they may not have stated a family relationship, many more of the signers were relatives or in-laws of Elizabeth Dennison (Poole) Hale and her husband Joseph Hale. The Massachusetts Historical Society has an archive of the Hale and Low families of Massachusetts, including 158 portrait photographs. It's possible that the collection includes photographs of Joseph Hale and Elizabeth Dennison (Poole) Hale and their children, sent from California. Joseph Hale's sister, Annie Gale Woodbury Hale married George W. Low, a Cambridge, Massachusetts, merchant. 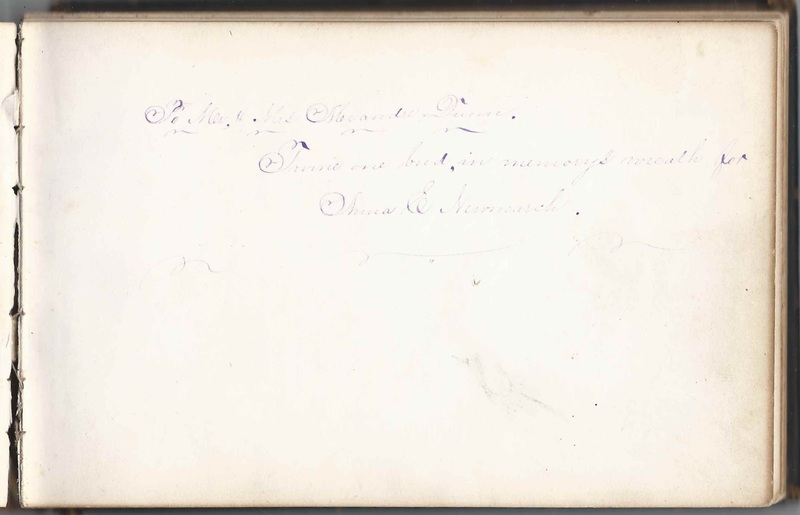 Two of their children signed pages in Lizzie's album: Joseph Herbert Low, born 1860; and Louis Frederick Low, born 1863. 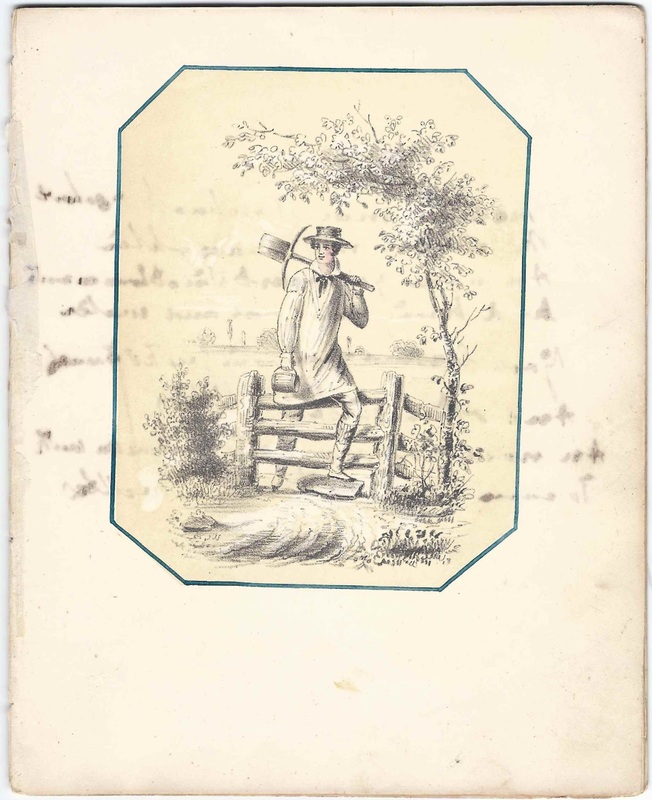 Lester Cross, signed at Stockton, California, on May 13, 1884; "Aged 81"
S. A. Gardner of Milford, Massachusetts; "Fruit-eater"
Frank C. Hale, signed at Topeka, Kansas, on June 4, 1884; "your cousin". She may have been Frances (Cook) Hale, wife of George Dennison Hale, who was related to Lizzie's husband Joseph Hale and may have been related to Lizzie as well, through the Dennison line. George D. Hale of Topeka, Kansas, signed on June 4, 1884. "Cousin". He was George Dennison Hale, husband of signer Frank C. Hale, who was Frances (Cook) Hale. He was likely a cousin of Lizzie's husband Joseph Hale, but may have been related to Lizzie as well, through her Dennison line. Charles T. Hale of Rockport, Massachusetts, signed on September 14, 1884. Presumably Charles Thomas Hale, a nephew to Lizzie's husband Joseph Hale. Albert W. Hale of Rockport, Massachusetts, signed on September 17, 1884. 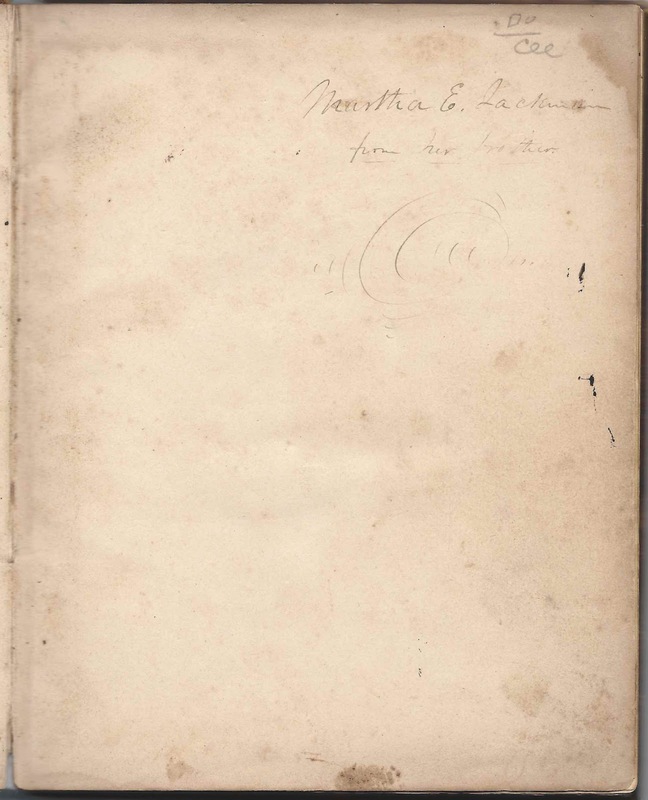 He was Albert William Hale, whose wife Sarah Jane (Goodrich) Hale signed the right facing page. Sarah Hale of Rockport, Massachusetts, signed on September 17, 1886. She was Sarah Jane (Goodrich) Hale, whose husband Albert W. Hale signed the left facing page. Albert G. Hale of Rockport, Massachusetts, signed on September 18, 1884; son of signers Albert W. Hale and Sarah Jane (Goodrich) Hale. John P. Hale of Rockport, Massachusetts, signed on September 19, 1884; son of signers Albert William Hale and Sarah Jane (Goodrich) Hale. Albert G. Hale of Rockport, Massachusetts, "Aged 71 years". 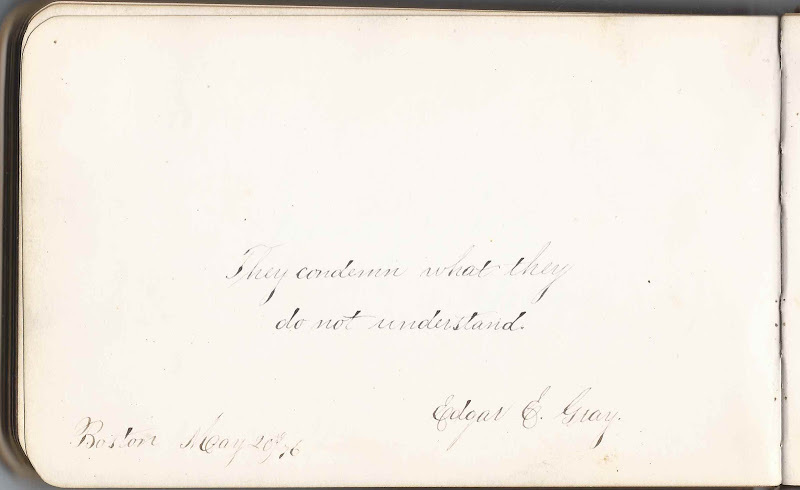 Albert Giddings Hale (1813-1896), whose wife Mary Choate (Blatchford) Giddings signed the right facing page. Mary C. Hale; "Aged 69 years". 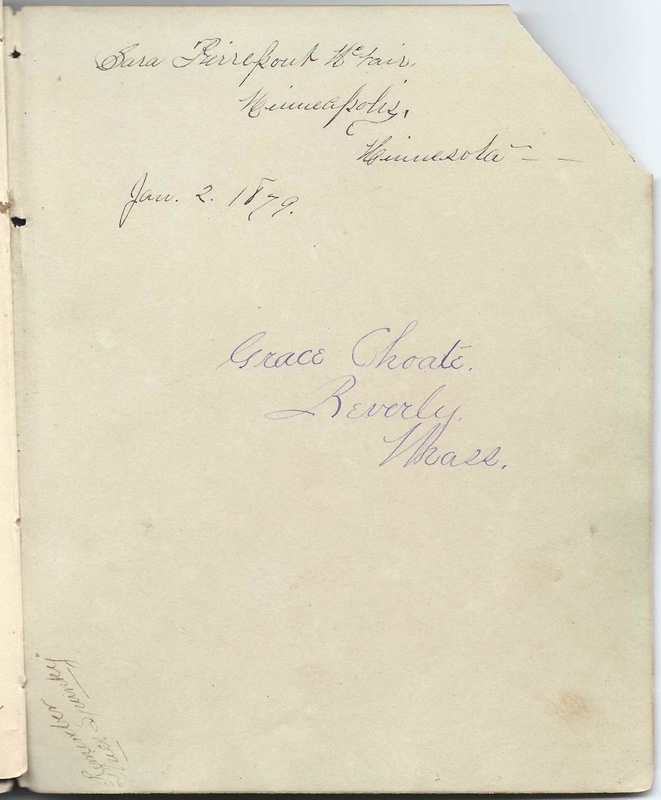 She was Mary Choate (Blatchford) Hale (1821-1897), whose husband Albert Giddings Hale signed the left facing page. Grace F. Hale of Cambridge, Massachusetts, signed on September 24, 1884. George W. R. Harriman of Dedham, Massachusetts, signed on September 22, 1884. He was George Winsor Richardson Harriman of Dedham, Massachusetts. Sarah J. W. Harriman, signed on September 22, 1884 at Dedham, Massachusetts. She was Sarah Jane (Wheeler) Harriman, wife of John Emery Harriman. Iva N. Johnson of San Jose, California, signed on November 14, 1891; middle initial might be W or ? Mary C. Knowlton of Rockport, Massachusetts, signed on October 18, 1884; shared the page with Margie S. Knowlton. Lucy A. Knutsford of Rockport, Massachusetts, signed on September 15, 1884. Mary Augusta Lane of Lanesville [village in Gloucester, Massachusetts] on October 12, 1884. Sophie P. Merrill of Salem, Massachusetts, signed on September 20, 1884. L. M. Nichols, signed on June 8, 1884; "your friend and neighbor. 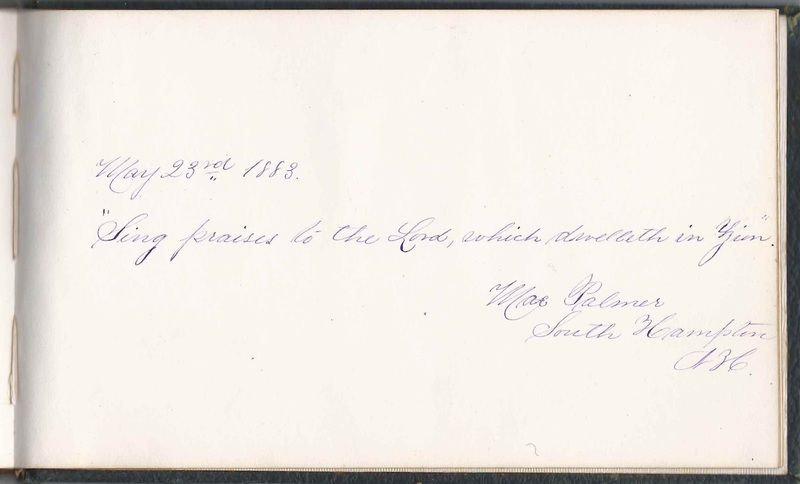 The right facing page was signed by H. P. Nichols at Chicago, Illinois, on June 8, 1884. Presumably Harrison P. Nichols. H. P. Nichols, signed at Chicago, Illinois, on June 8, 1884; presumably Harrison P. Nichols, brother of signer William Thomas Nichols. Mrs. Helen S. Nichols of Haywood, Illinois. Helen Sereptah (Crampton) Nichols, second wife of signer William Thomas Nichols, and mother of Harry Hayward Nichols, who signed the overleaf. Theodore Parsons of Gloucester, Massachusetts, signed on October 14, 1884. Martha L. Pickering, signed at Rockport, Massachusetts, on October 25, 1884; Lizzie's cousin. 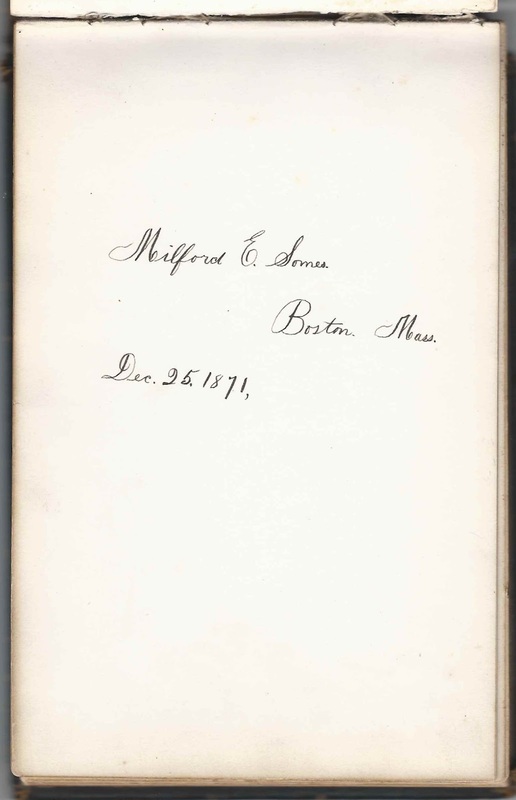 Mrs. Francis Proctor of Gloucester, Massachusetts, signed on October 10, 1884. 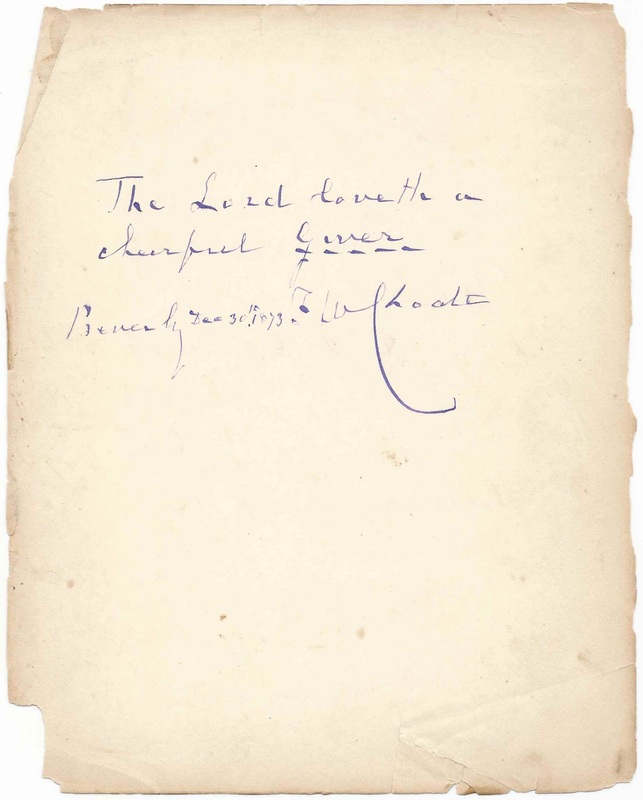 Her husband Francis Proctor signed the right facing page. Francis Proctor, signed at Gloucester, Massachusetts, on October 10, 1884. I don't know if he was Francis Proctor the father or Francis Proctor the son. "In memory of my pleasant visit to your home at Stockton in May 1881. Also of your visit to my home." Joseph Sayward of Gloucester, Massachusetts, signed on October 11, 1884; his wife Mary (Williams) Sayward signed the right facing page. Mary W. Sayward of Gloucester, Massachusetts, signed on October 10, 1884. 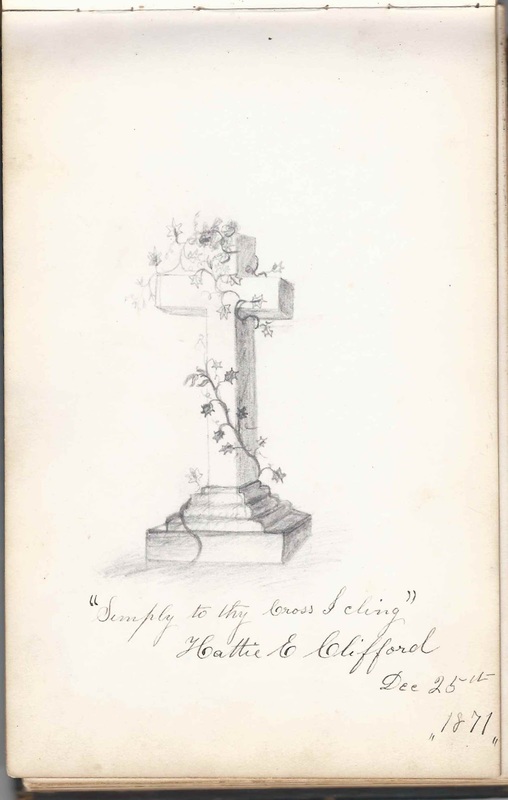 She was Mary (Williams) Sayward, whose husband Joseph Sayward ; her husband Joseph Sayward signed the left facing page. 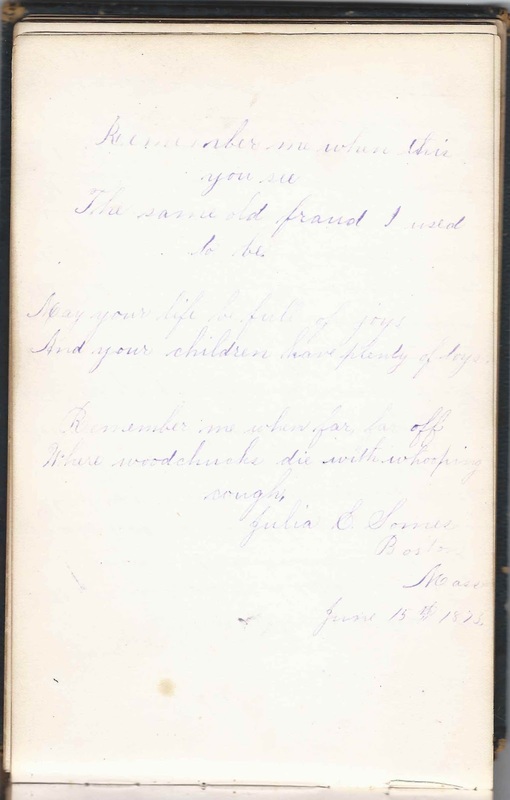 Anna H. Smith of Pigeon Cove, Massachusetts, signed on October 13, 1884; "your niece"
Ida A. Tarr of Rockport, Massachusetts, on September 17, 1884; she wrote on the page upside down. George J. Tarr of Rockport, Massachusetts, signed on September 17, 1884; his wife Oresa (Sanborn) Tarr shared the page. They wrote on the page upside down. Oresa Tarr of Rockport, Massachusetts, signed on September 17, 1884. She was Oresa (Sanborn) Tarr; her husband George J. Tarr shared the page. They wrote on the page upside down. William Williams of Gloucester, Massachusetts, signed on July 3, 1884. "Your old (90th year) friend". William wrote his name, shakily, but someone else wrote the rest. He was the husband of signer Mary R. Williams. Mary R. Williams of Gloucester, Massachusetts, signed on July 3, 1884. "Your old (86th year) friend". Like her husband William Williams, she signed her name only, and someone else inscribed the rest. She was Mary Ring (Steele) Williams, wife of signer William Williams. Isaac De. Woodbury of Melrose Highlands, Massachusetts, signed on September 29, 1884. He was Isaac De Saint Croix Woodbury; his wife Martha Elizabeth (Parmelee) Woodbury shared the page. M. E. Woodbury of Melrose Highlands, Massachusetts, signed on September 29, 1884. She was Martha Elizabeth (Parmelee) Woodbury; her husband Isaac De Saint Croix Woodbury shared the page. Alphonso Woodbury; he shared the page with his wife Susan (Woodbury) Woodbury of Folly Cove, Massachusetts, who signed the page on October 19, 1884. Susan Woodbury of Folly Cove, Massachusetts, signed on October 19, 1884. She was Susan (Woodbury) Woodbury of Gloucester, Massachusetts, wife of Alphonso Woodbury, who shared the page. W. F. Wright of San Jose, California, signed on November 14, 1891. William F. Wright, husband of signer Linnie M. Wright. Linnie M. Wright of San Jose, California, signed on November 14, 1891. Wife of signer William F. Wright. 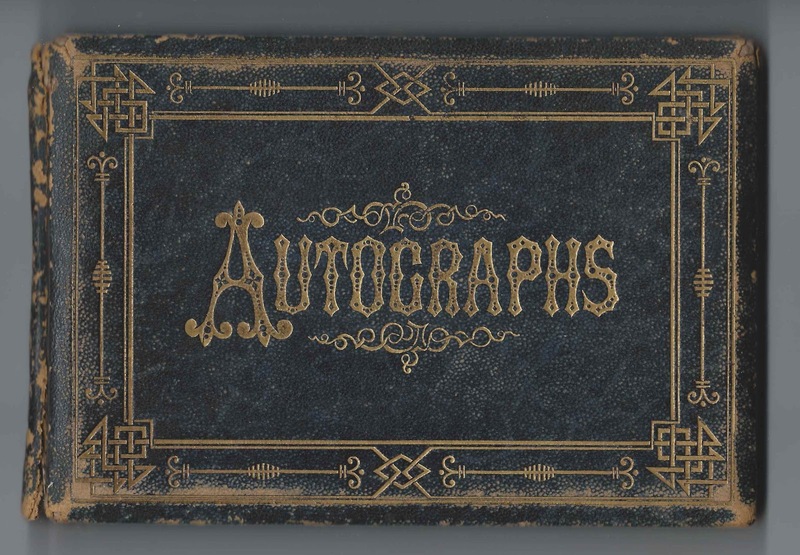 1876-1883 autograph album that belonged to a "Ria" of the Boston, Massachusetts, area. It's likely that Ria was a granddaughter of Jesse and Mary Salmon of New York and Boston, Massachusetts, as Ria's unmarried aunt, Maria J. Salmon, signed a page at Charlestown, Massachusetts, on December 3, 1877. Ria may have been Lydia Clouston, who married signer Edgar Elmer Gray, whose sister's album, that of Ida May (Gray) Dunn, was found with this one. Or Lydia may have been the album owner's cousin. 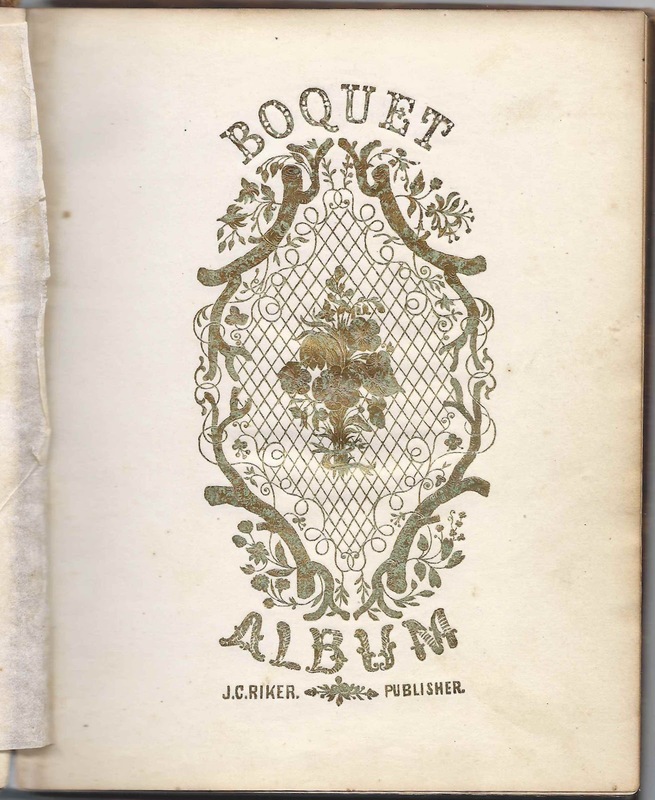 The album is approximately 7-3/4" x 5" and contains the sentiments of 35 of Ria's relatives and friends. An alphabetical list of the signers appears at the end of this post. Maria J. Salmon, born about 1840. I don't believe she married. 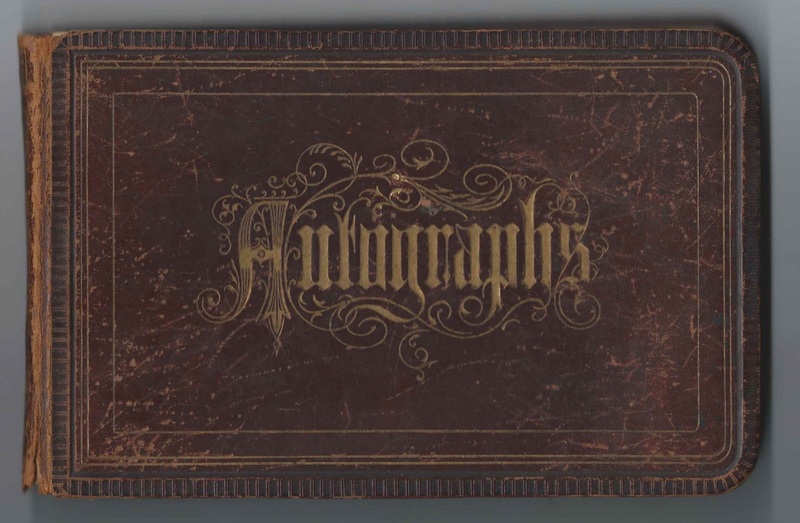 Except for Lydia, all of these siblings signed pages in Ria's album, Maria's shown above, and the others shown below. 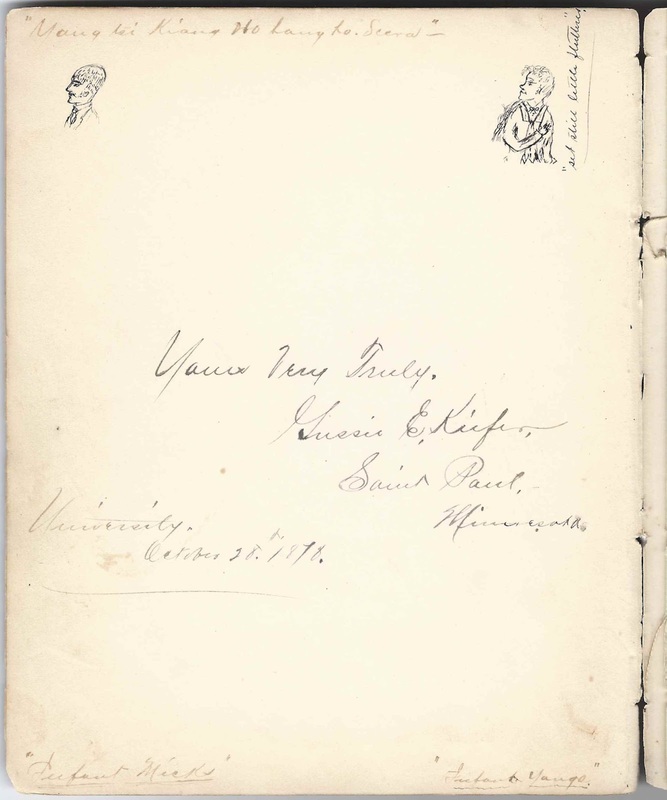 Annie (Salmon) Marston and her husband George W. Marston of Derby, Vermont, signed facing pages. 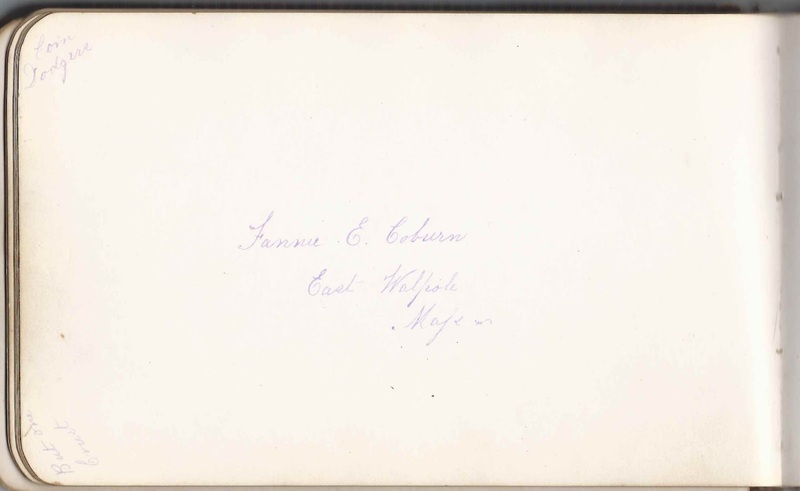 Annie (Salmon) Coburn and husband Henry E. Coburn of East Walpole, Massachusetts, signed facing pages. If you have a theory as to the identity of "Ria", or if you have corrections and/or additions to the information above, or information on any of the signers listed below, please leave a comment or contact me directly. Thanks! "Ria"; album owner of Massachusetts. She may have been Maria. It's likely that one her parents was the child of Jesse and Mary Salmon. Julia A. Coburn of Walpole, Massachusetts, signed on June 27, 1876; sister of signer Henry E. Coburn, husband of signer Frances E. (Salmon) Coburn, "Fannie". Fannie E. Coburn of East Walpole, Massachusetts. 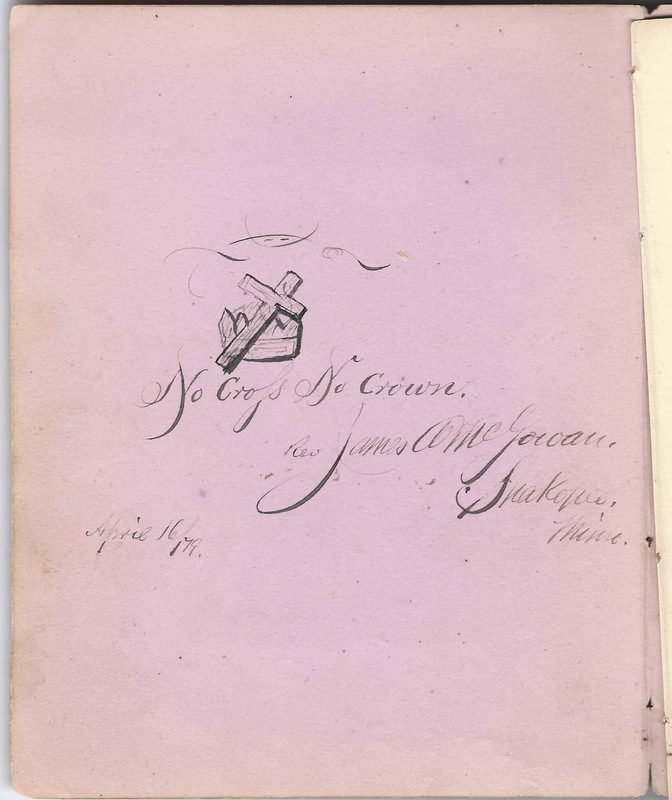 Frances E. (Salmon) Coburn, wife of Henry E. Coburn, who signed the right facing page, and sister of signer Maria J. Salmon, who called album owner Ria her niece. She may have been Ria's mother or aunt. H. E. Coburn of East Walpole, Massachusetts. 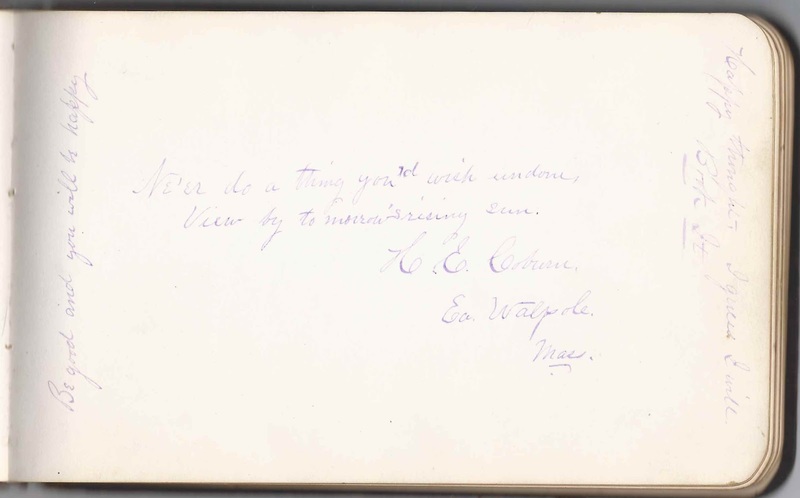 He was Henry E. Coburn, whose wife Fannie E. (Salmon) Coburn signed the left facing page. He may have been Ria's father or uncle. Edgar E. Gray, signed at Boston, Massachusetts, on May 20, 1876. He was Edgar Elmer Gray, half-brother of signer Milford Ernest Somes. 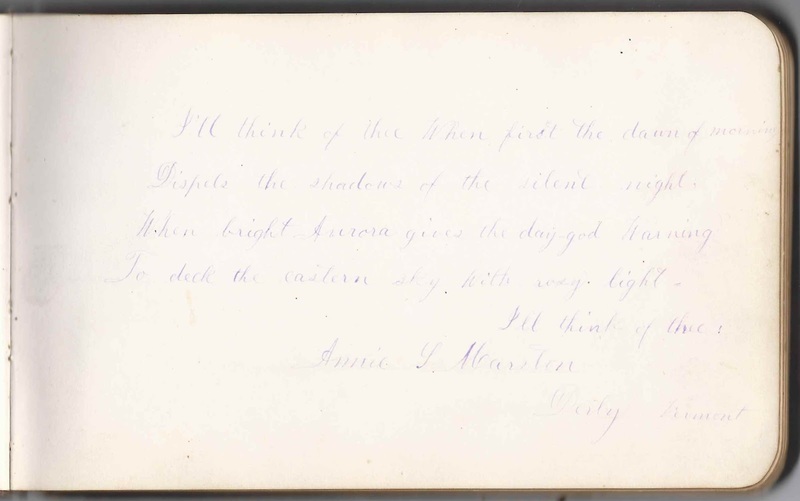 George W. Marston of Derby, Vermont; his wife Annie (Salmon) Marston signed the right facing page. He may have been Ria's father or uncle. Annie S. Marston of Derby, Vermont. She was Annie (Salmon) Marston, sister of signer Maria J. Salmon, who called album owner Ria her niece. Annie may have been Ria's mother or aunt. 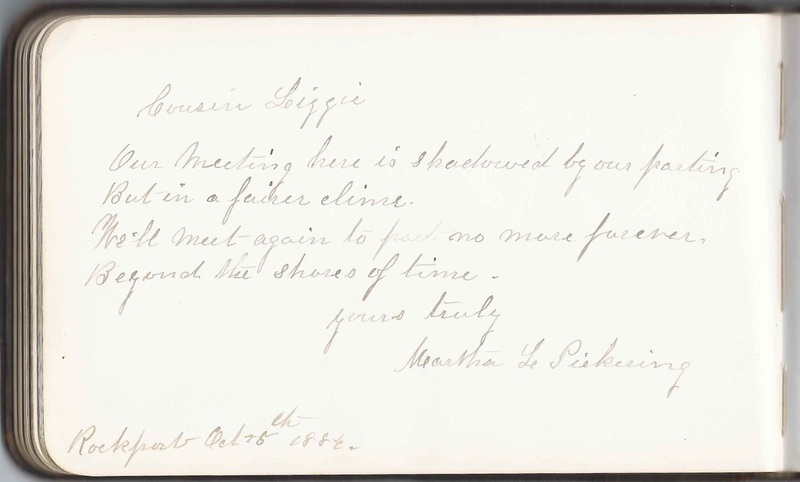 Annie's husband George W. Marston signed the left facing page. 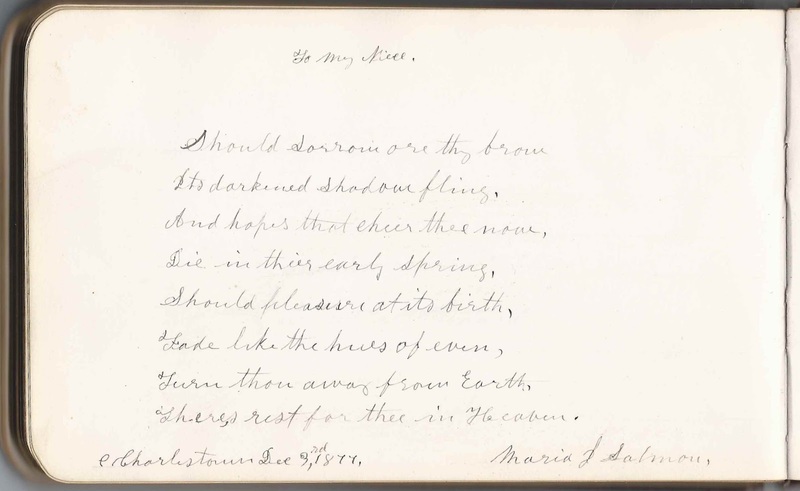 Maria J. Salmon, signed at Charlestown, Massachusetts, on December 3, 1877. She inscribed her page "To My Niece". Ria was likely the daughter of one of Maria's siblings, possibly signer Annie (Salmon) Marston, wife of George W. Marston, who also signed a page. Or sibling Frances E. (Salmon) Coburn, "Fanny", who signed a page, along with her husband Henry E. Coburn. Or another sibling as yet unknown to me. Could album owner "Ria" have been named Maria in honor of her aunt? Milford E. Somes, "alias Reddy", signed at Boston, Massachusetts, on August 15, 1883. He was Milford Ernest Somes, half brother of signer Edgar Elmer Gray.